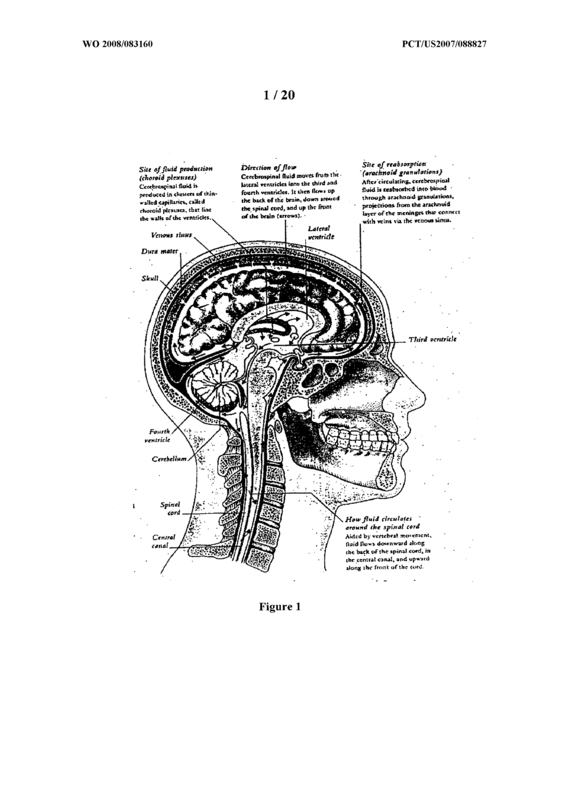 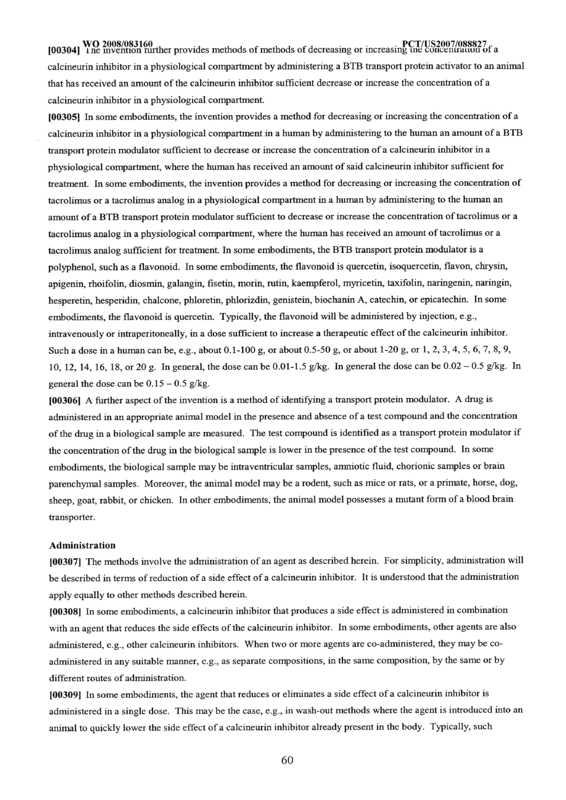 Methods and compositions are described for the modulation of central nervous system and/or fetal effects of calcineurin inhibitors. 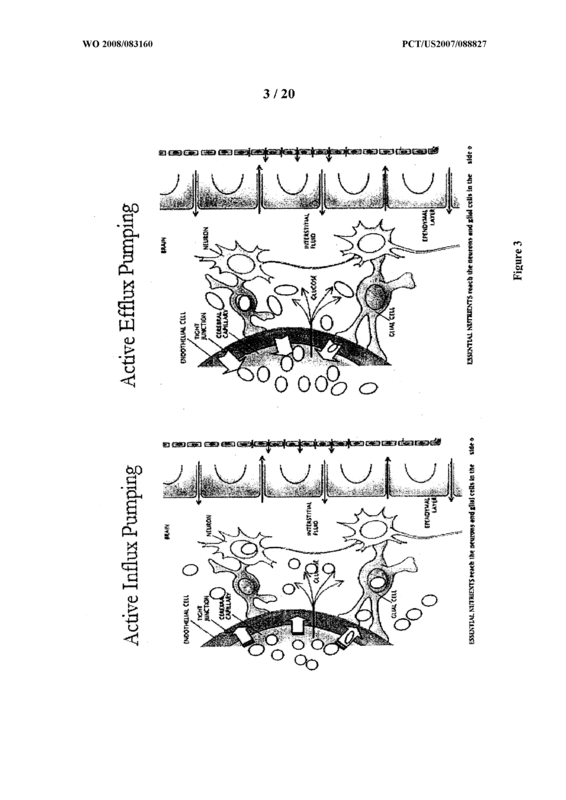 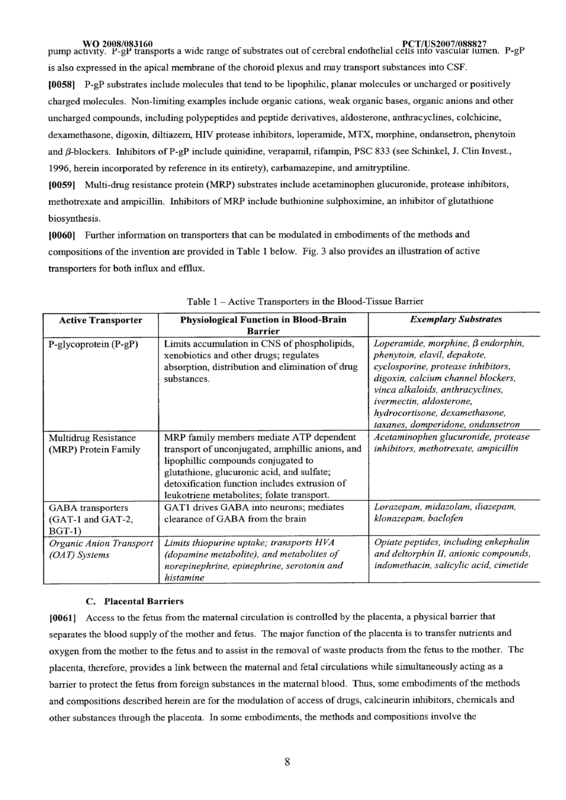 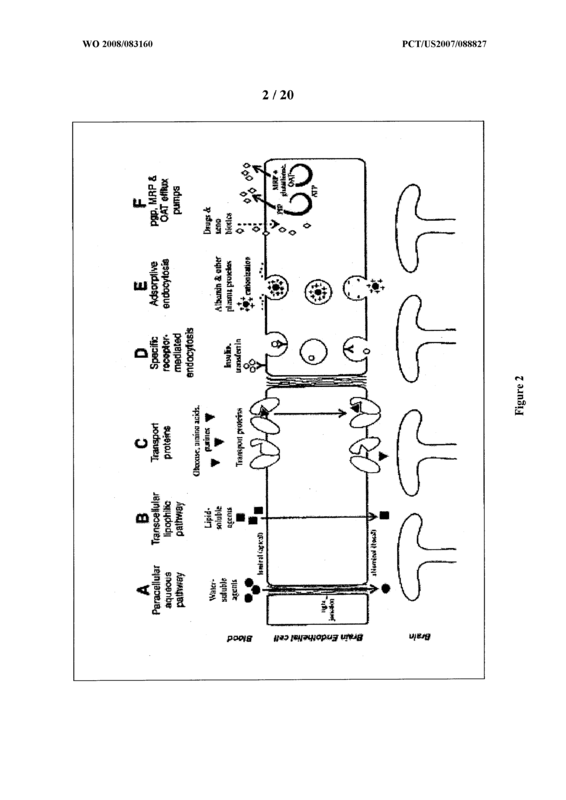 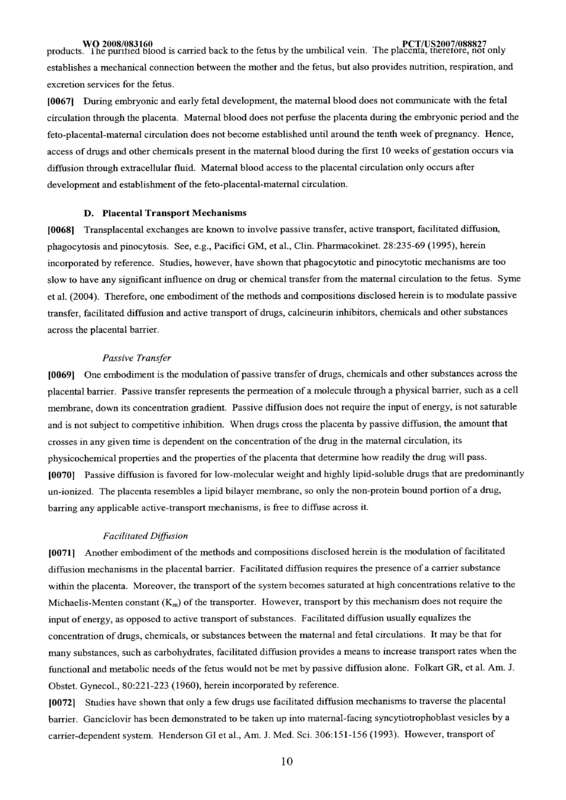 Methods and compositions are described for the modulation of efflux transporter activity to increase the efflux of calcineurin inhibitors out of a physiological compartment and into an external environment. 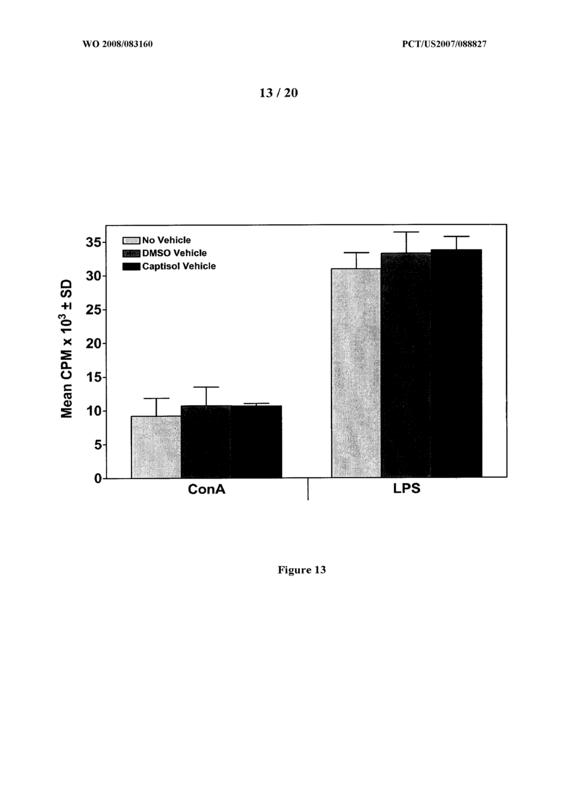 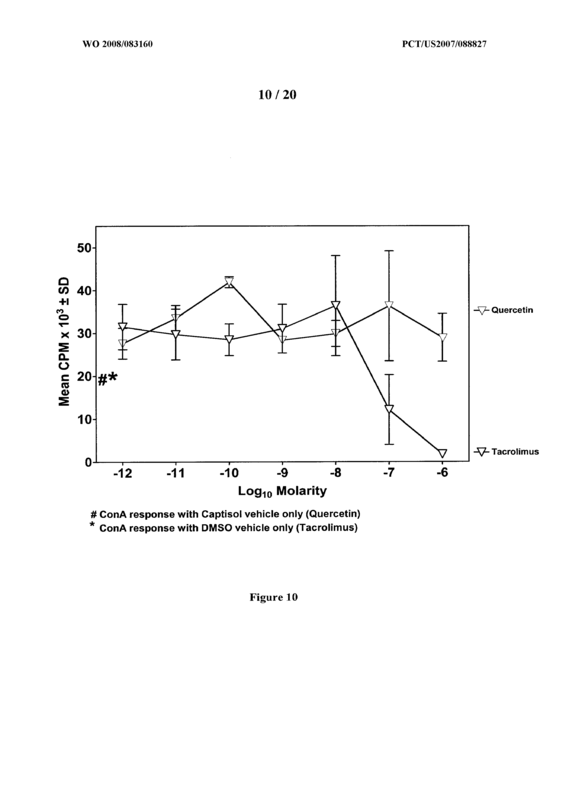 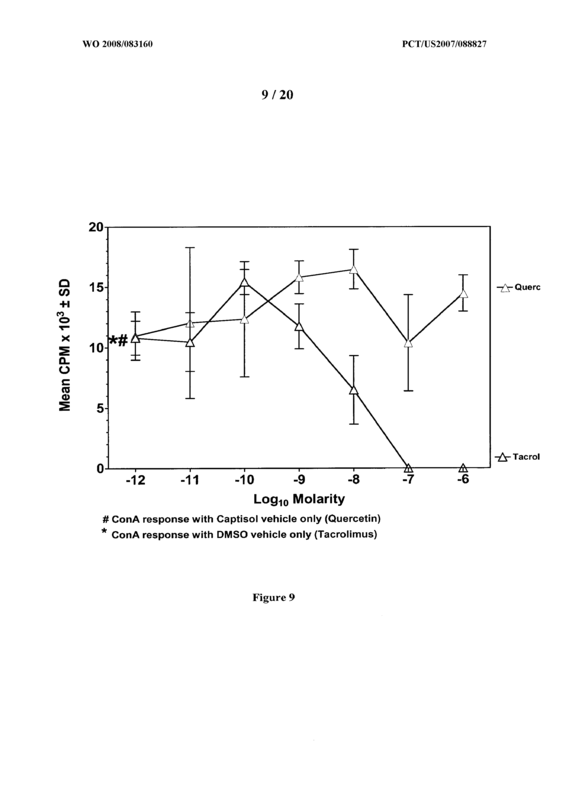 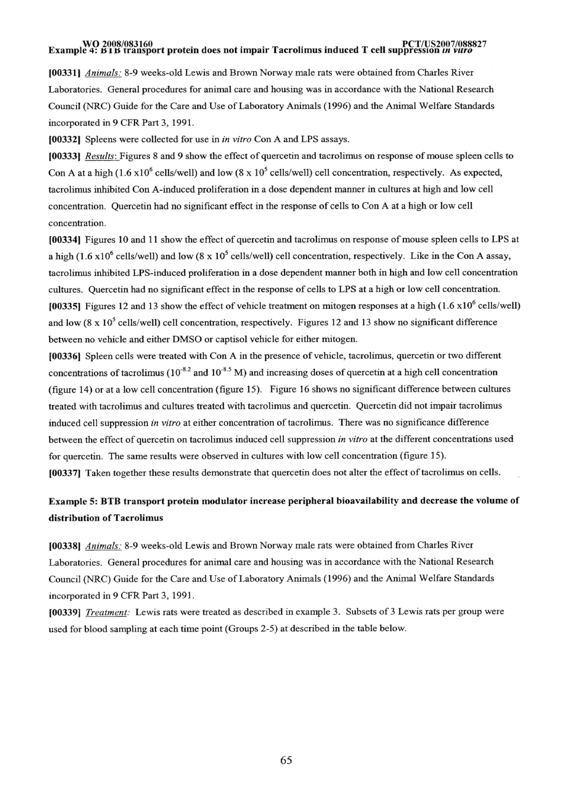 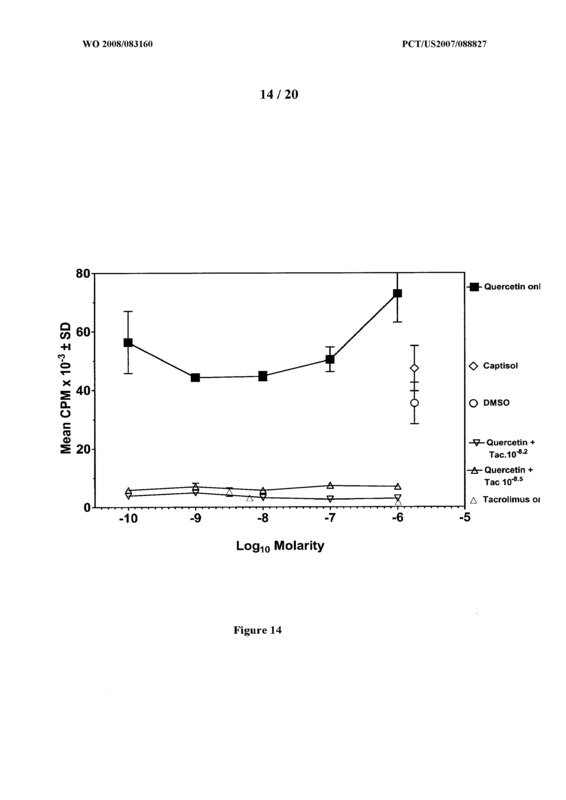 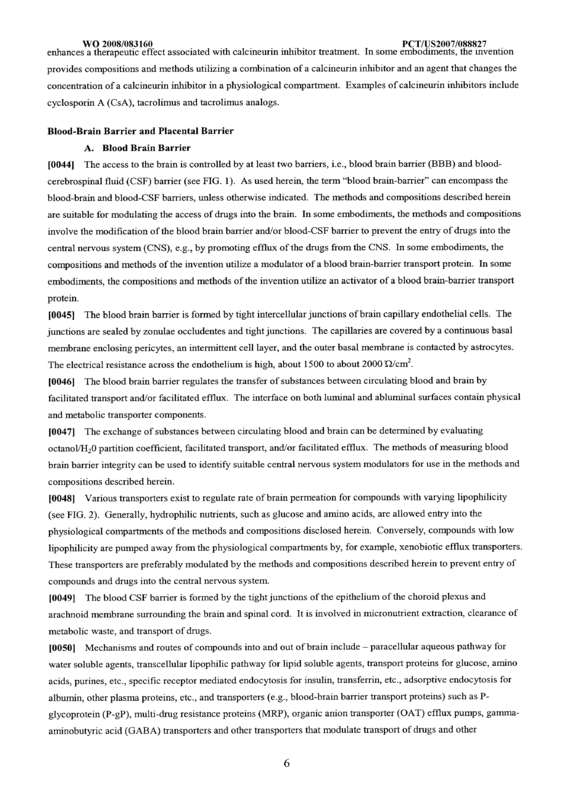 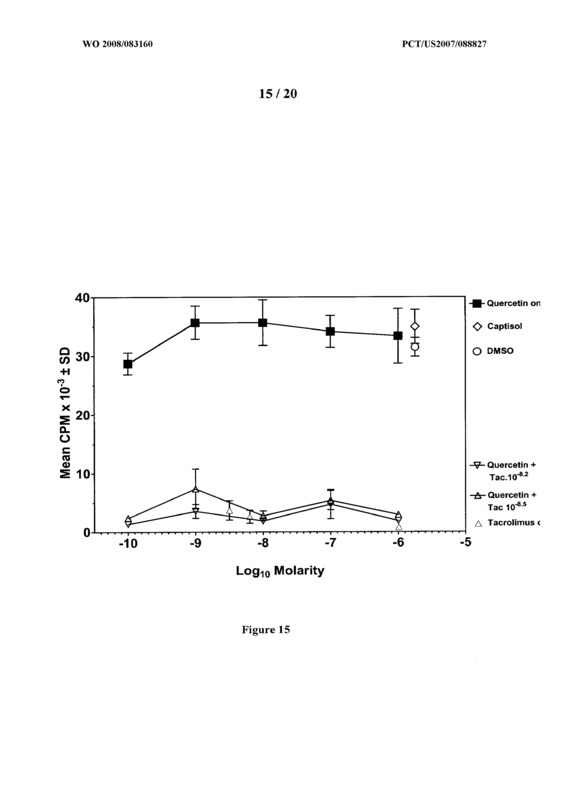 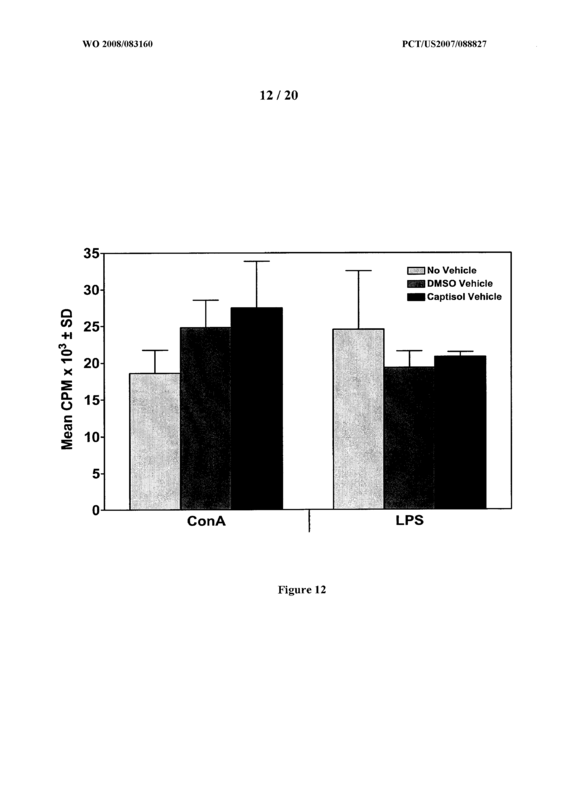 In particular, the methods and compositions disclosed herein provide for the increase of efflux transporter activity at Blood-Tissue, blood-CSF and placental-maternal barriers to increase the efflux of calcineurin inhibitor from physiological compartments, including central nervous system and fetal compartments. 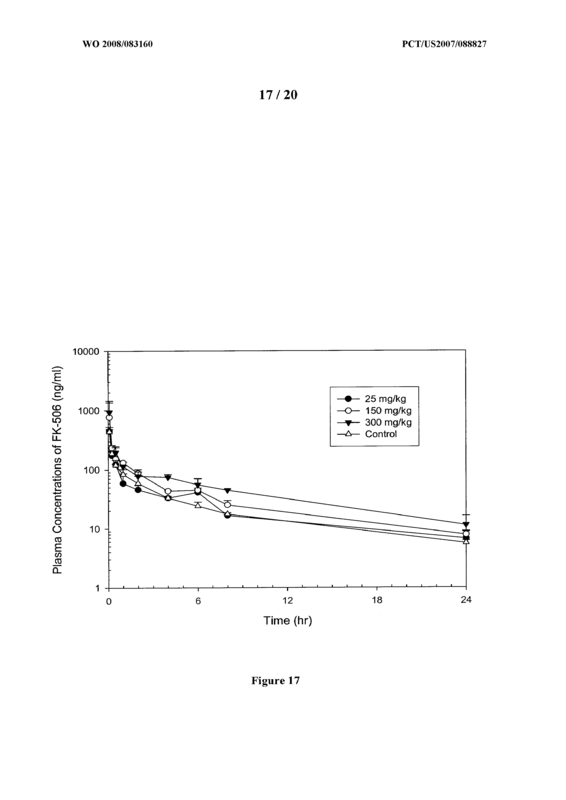 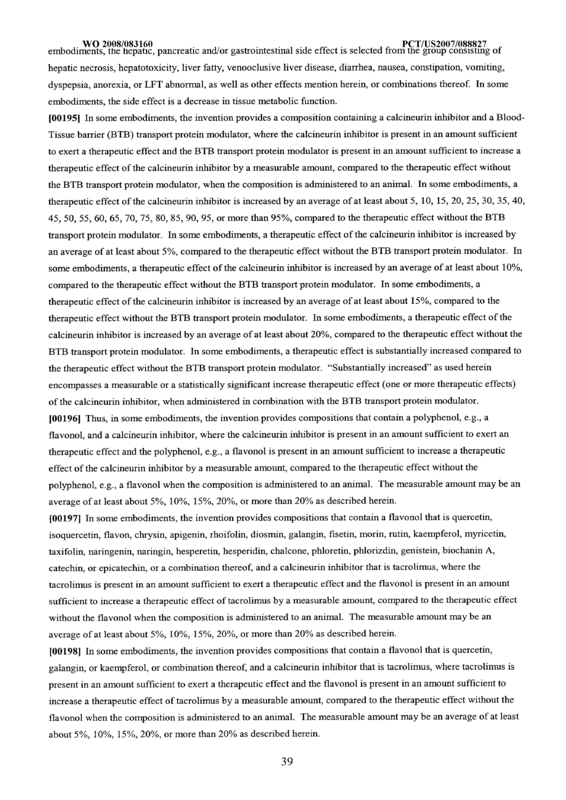 A composition comprising an effective amount of a calcineurin inhibitor and an amount of a BTB transport protein modulator sufficient to reduce a side effect of the calcineurin inhibitor. 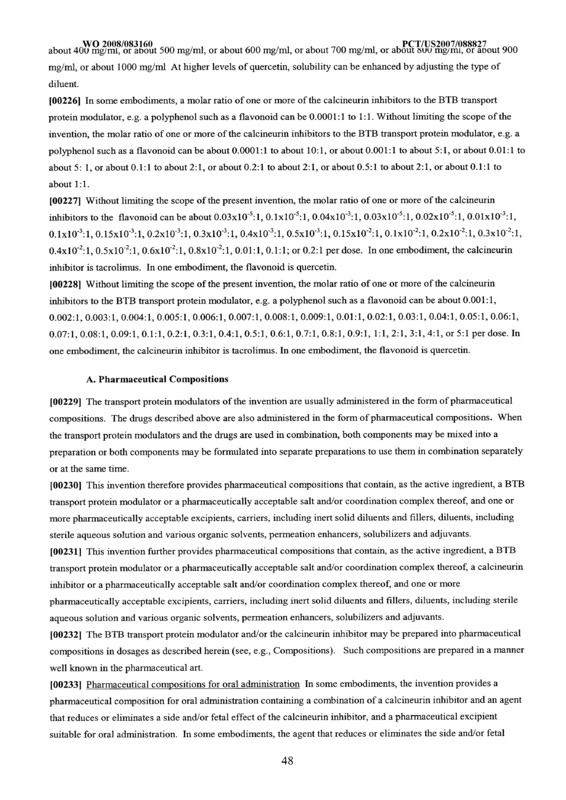 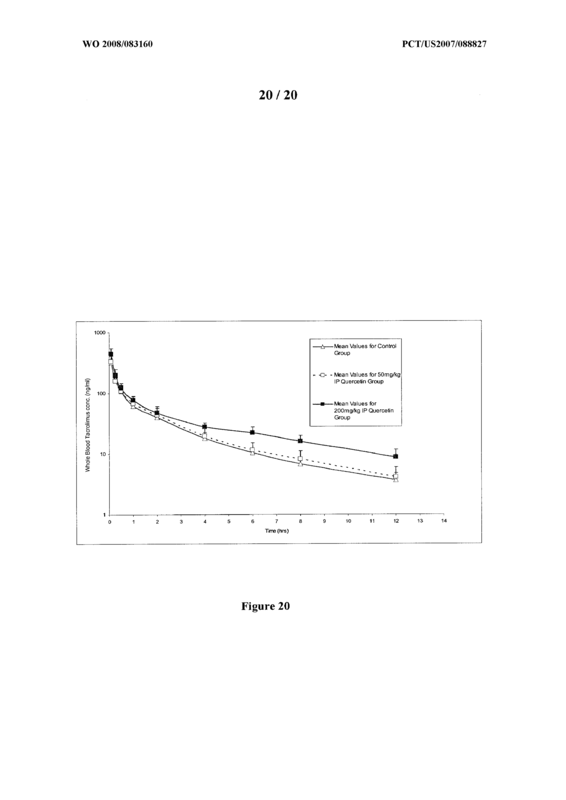 2 A pharmaceutical composition compπsing the composition of claim 1 and a pharmaceutically acceptable earner. 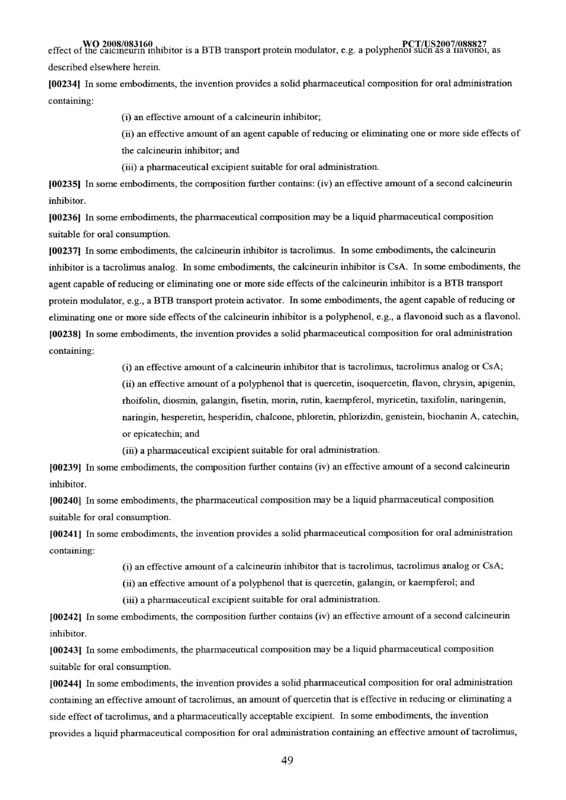 3 The composition of claim 1 wherein said calcineuπn inhibitor is tacrolimus. 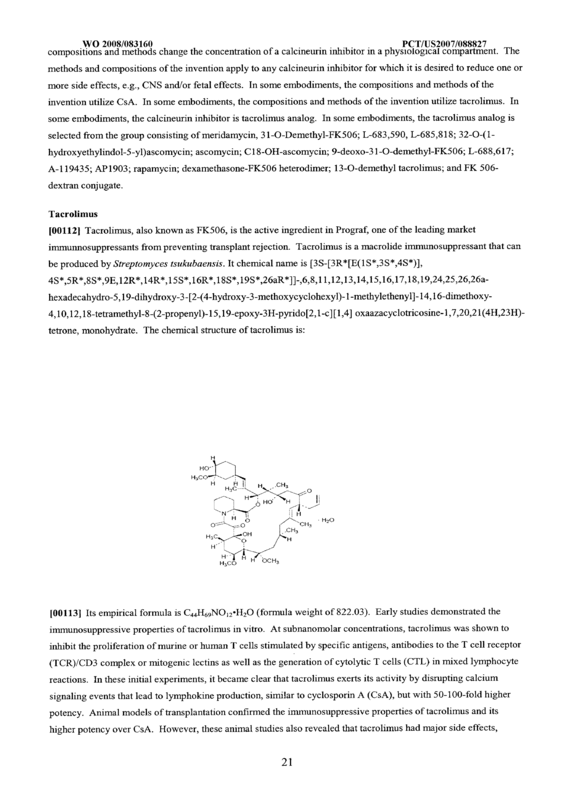 4 The composition of claim 1 wherein said calcineurin inhibitor is a tacrolimus analog. 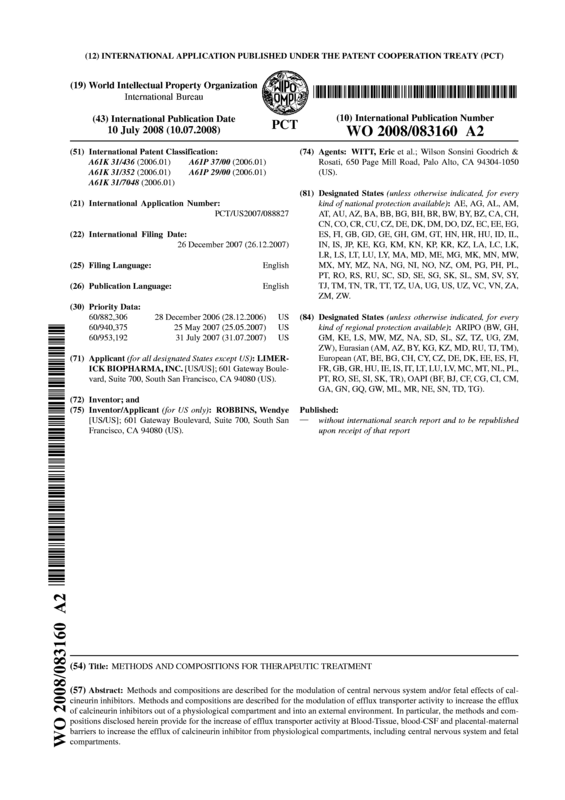 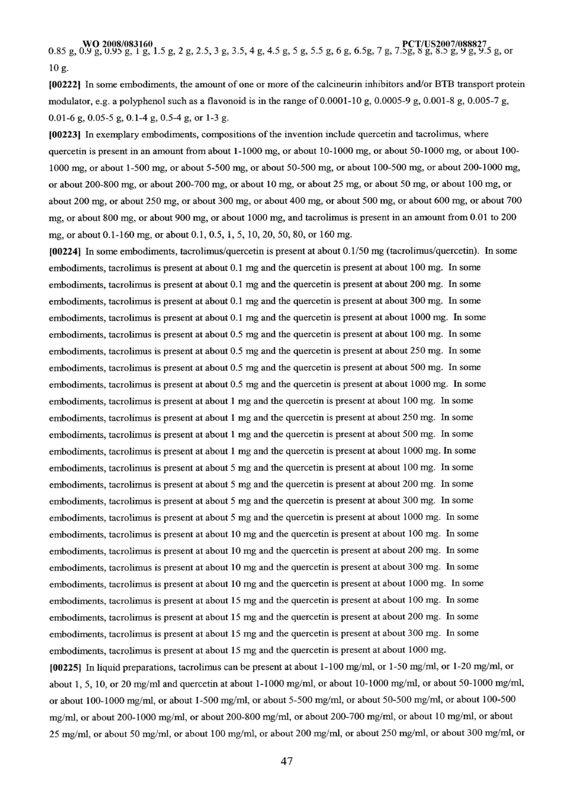 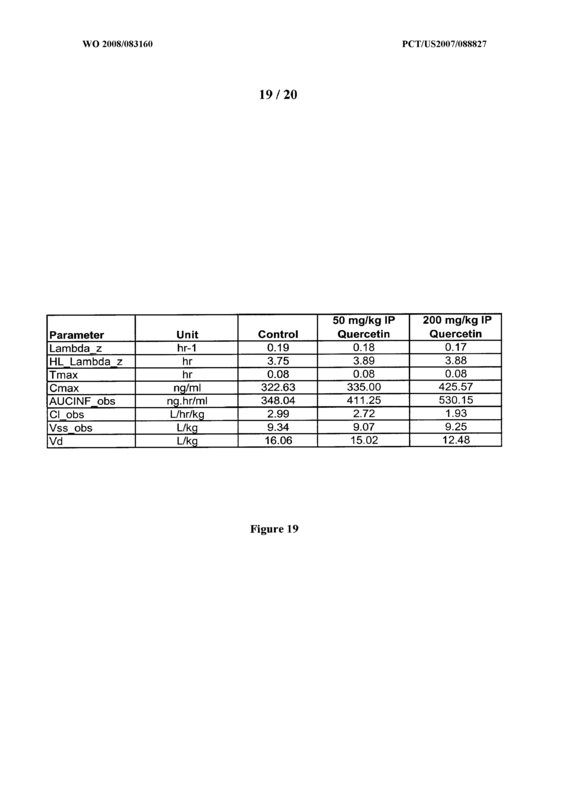 The composition of claim 4 wherein said tacrolimus analog is selected from the group consisting of meridamycm, 31-O-Demethyl-FK506; L-683,590, L-685,818; 32-O-(l-hydroxyethylmdol-5-yl)ascomycin, ascomycin; C18-OH-ascomycin; 9-deoxo-31-O-demethyl-FK506; L-688,617; A-119435; AP1903, rapamycin; dexamethasone-FK506 heterodimer; 13-O-demethyl tacrolimus; and FK 506-dextran conjugate. 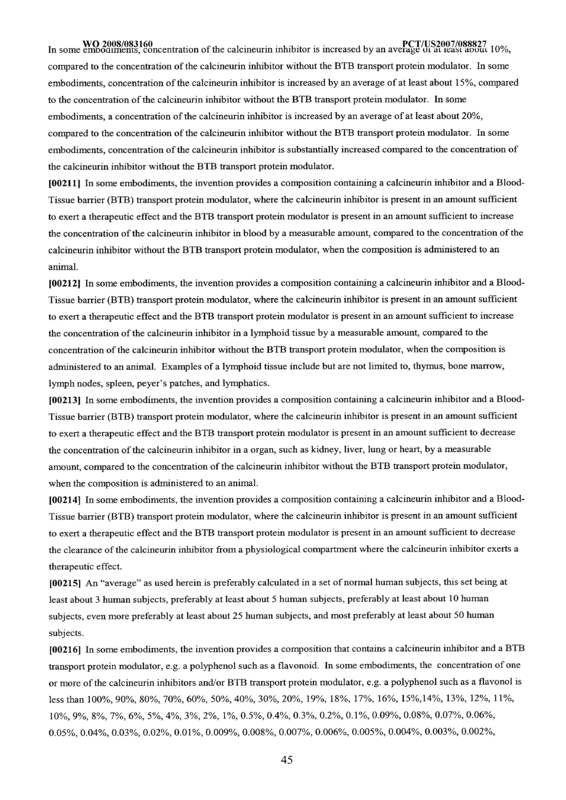 The composition of claim 1 wherein the BTB transport protein is an ABC transport protein. 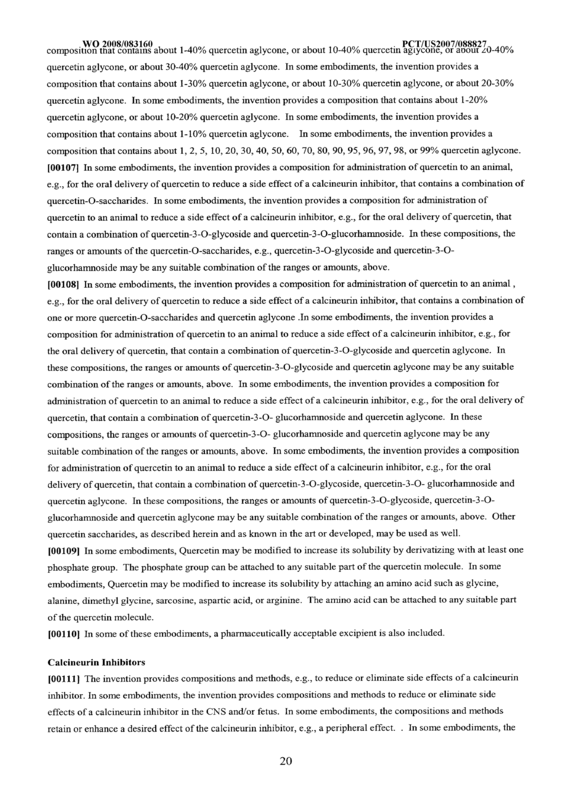 The composition of claim 6 wherein the ABC transport protein is a P-gP. 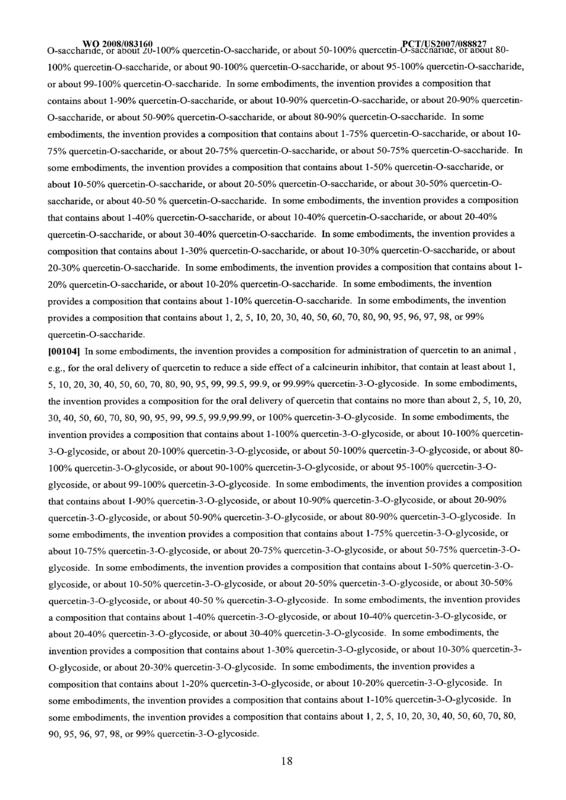 The composition of claim 8 wherein said flavonoid or flavonoid derivative is selected from the group consisting of quercetm, isoquercetm, flavon, chrysin, apigenm, rhoifolin, diosmin, galangin, flsetm, moπn, rutin, kaempferol, myricetin, taxifohn, nanngenin, narmgin, hesperetin, hespeπdin, chalcone, phloretm, phlorizdm, genistein, biochanin A, catechin, and epicatechin. 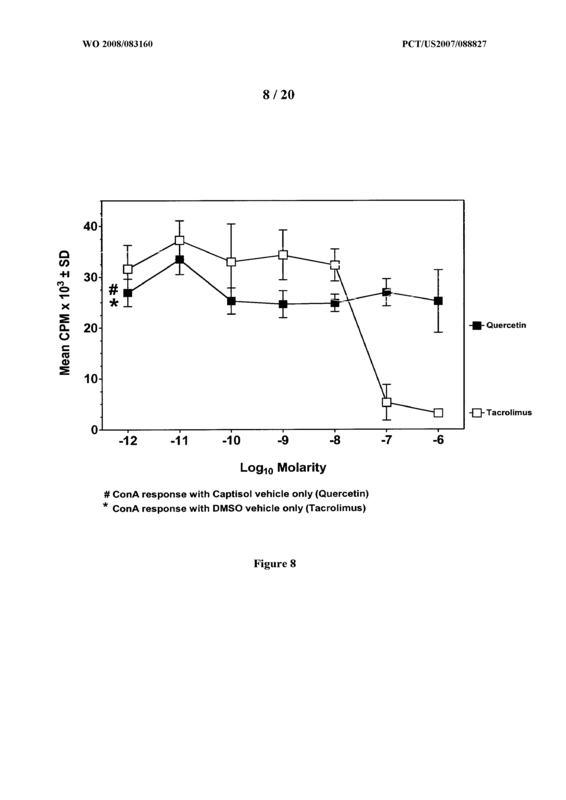 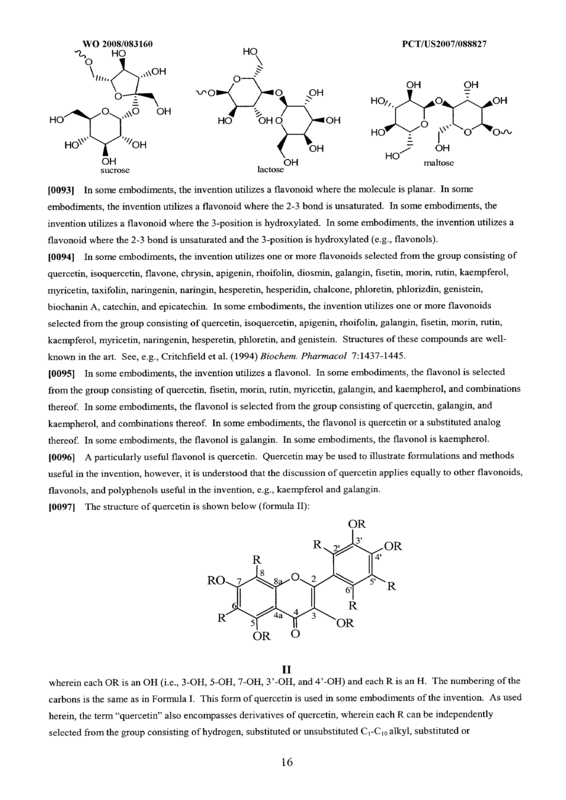 10 The composition of claim 9 wherein said flavonoid or flavonoid deπvative is quercetm or a quercetin deπvative. 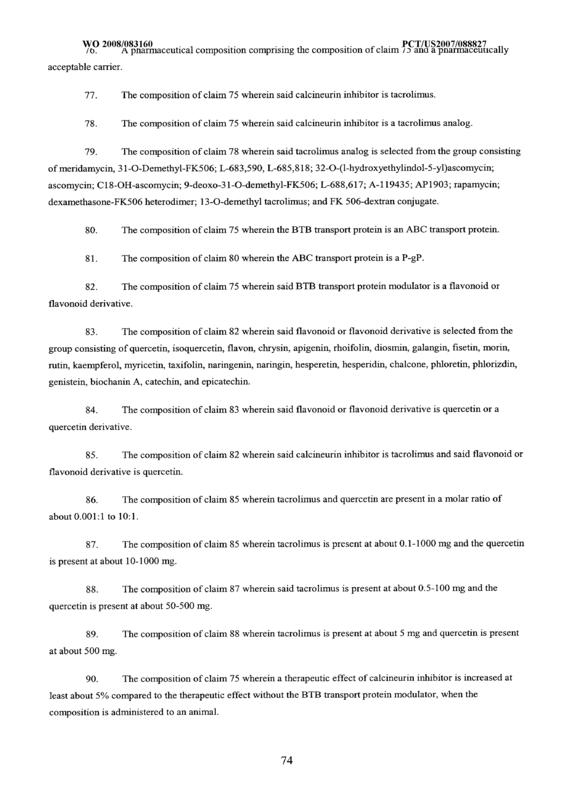 11 The composition of claim 1 wherein said calcineurin inhibitor is tacrolimus and said flavonoid or flavonoid derivative is quercetin. 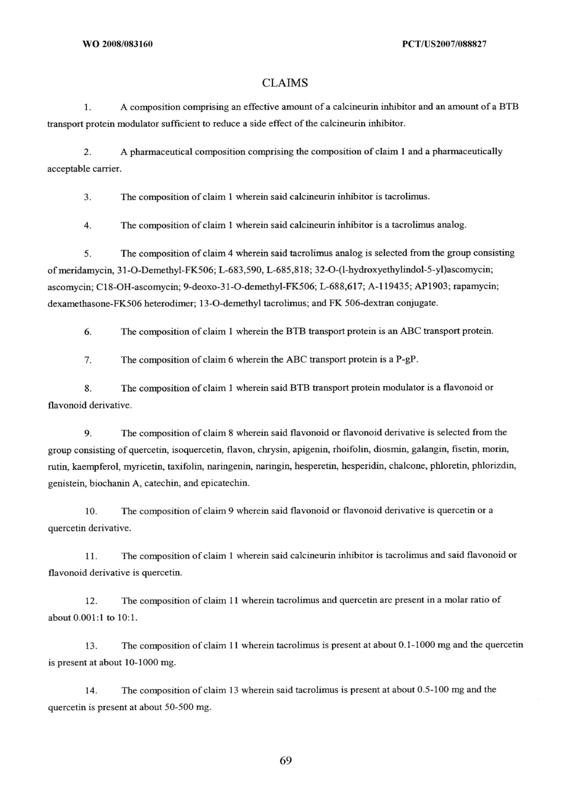 The composition of claim 11 wherein tacrolimus and quercetin are present in a molar ratio of about 0 001:1 to 10.1. 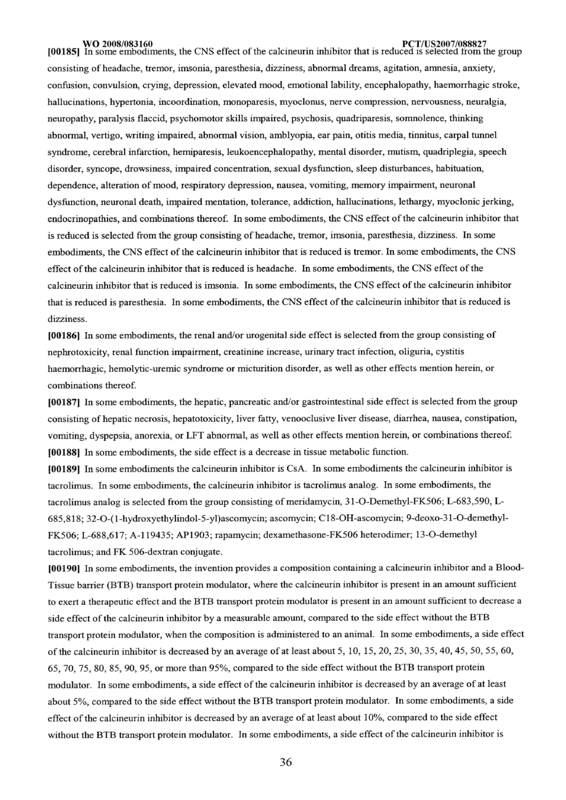 The composition of claim 11 wherein tacrolimus is present at about 0.1-1000 mg and the quercetin is present at about 10-1000 mg.
18 The composition of claim 17 wherein said side effect is a CNS side effect. 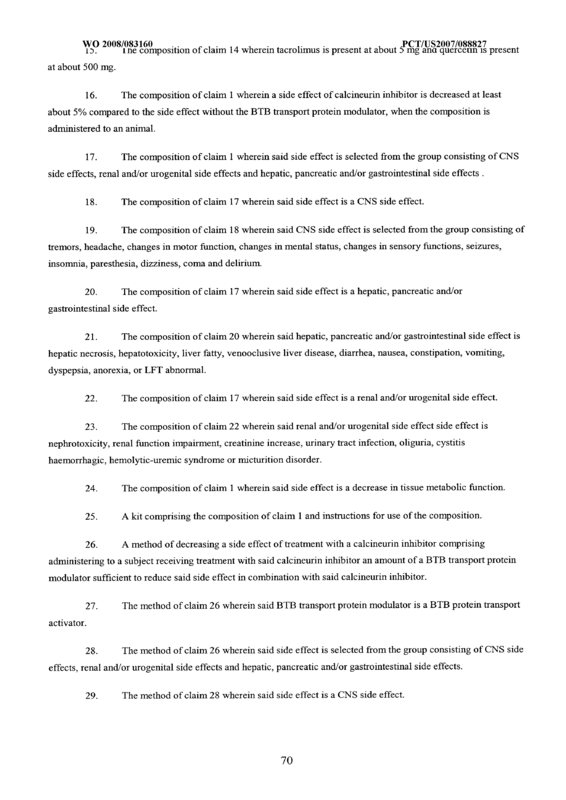 22 The composition of claim 17 wherein said side effect is a renal and/or urogenital side effect. 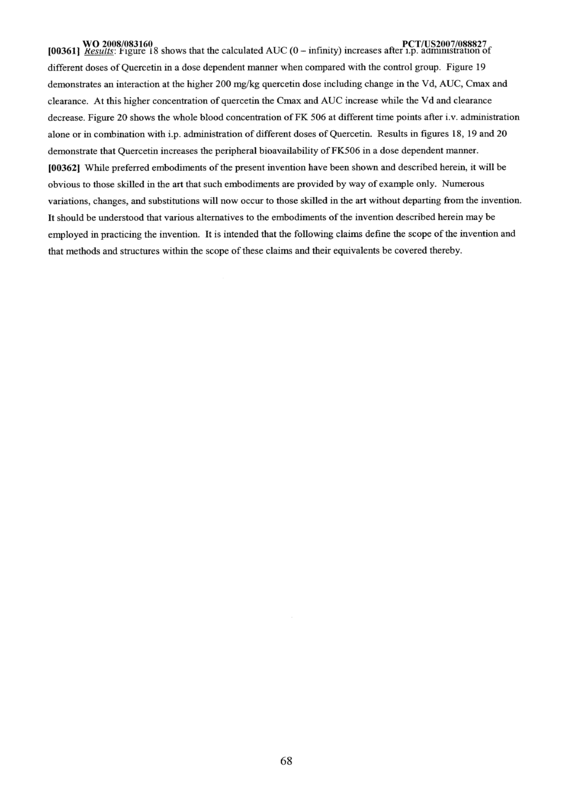 46 The method of claim 45 wherein said condition is organ transplant. 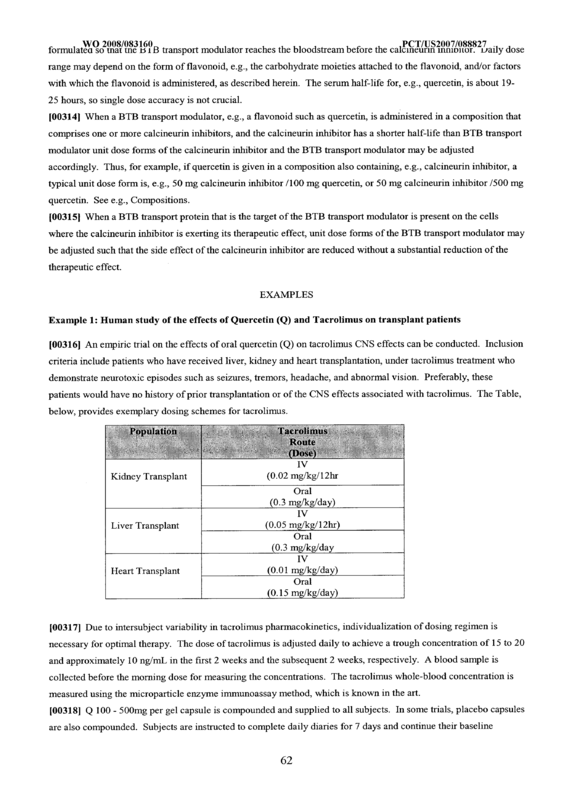 47 The method of claim 46 wherein said organ transplant is selected from the group consisting of kidney transplant, pancreas transplant, liver transplant, heart transplant, lung transplant, intestine transplant, pancreas after kidney transplant, and simultaneous pancreas-kidney transplant. 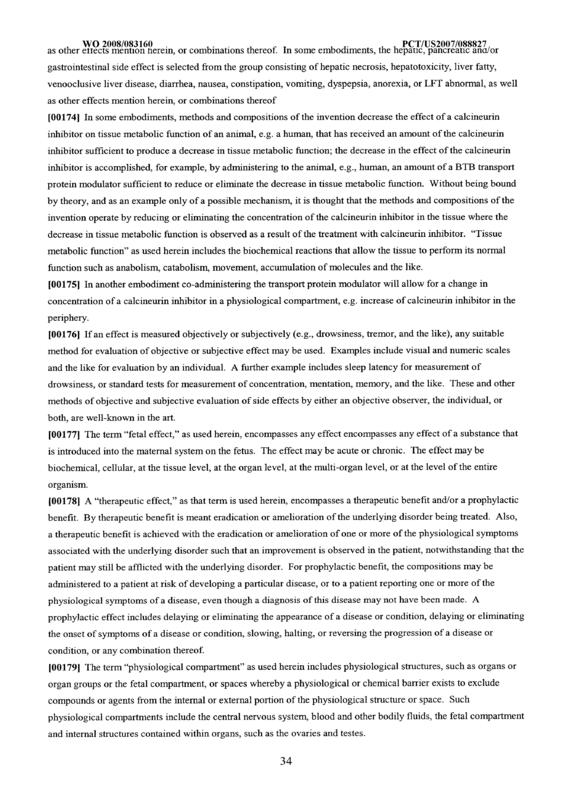 48 The method of claim 45 wherein said condition is an autoimmune disease. 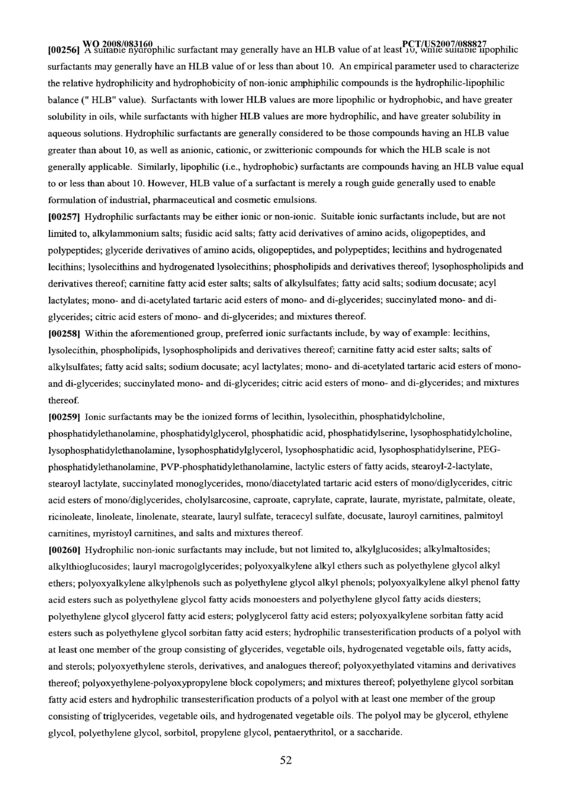 51 The method of claim 50 wherein said inflammatory disease is selected from the group consisting of asthma, vulvar lichen sclerosis, chronic allergic contact dermatitis, eczema, vitiligo and ulcerative colitis. 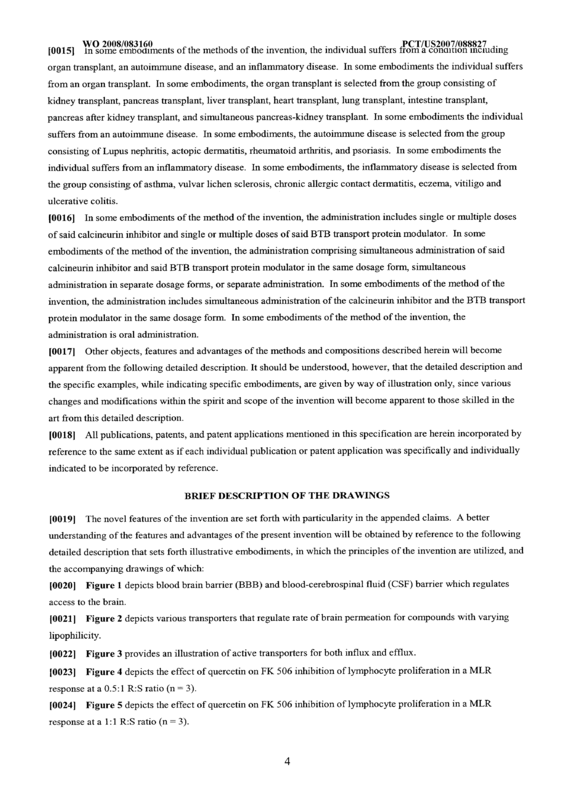 52 The method of claim 26 wherein said administration comprises single or multiple doses of said calcineurin inhibitor and single or multiple doses of said BTB transport protein modulator. 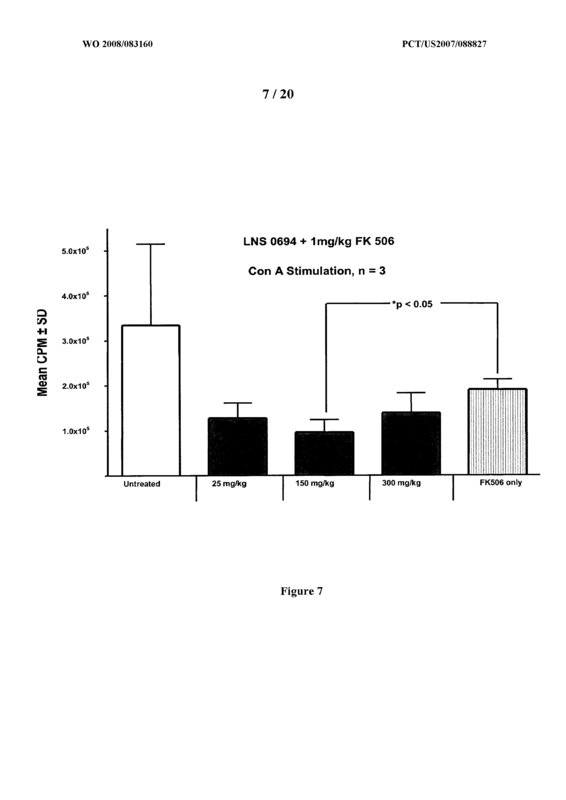 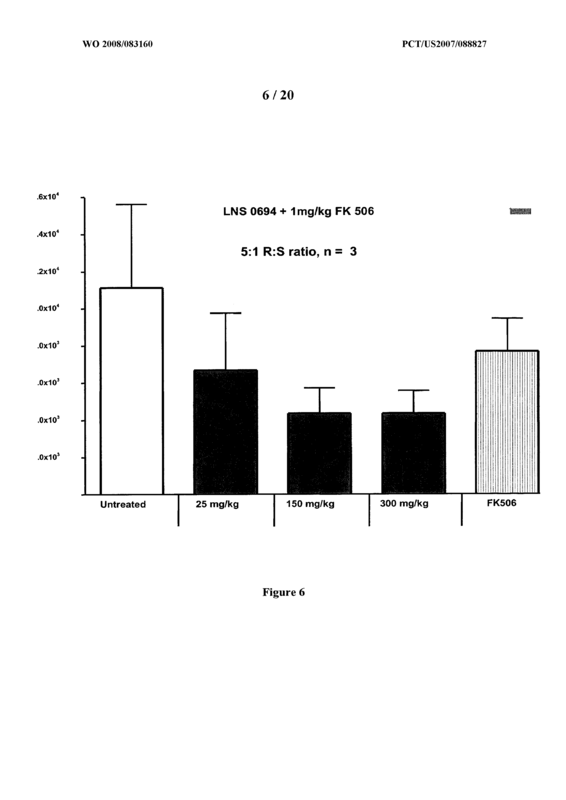 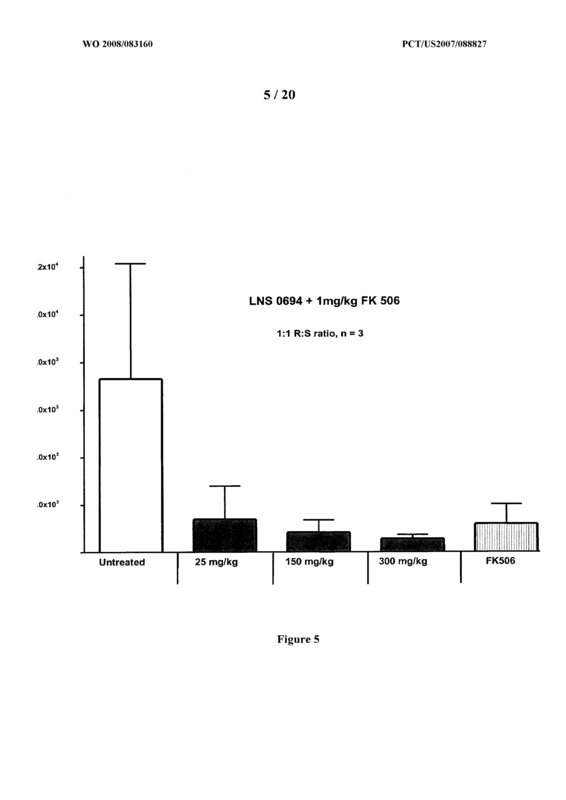 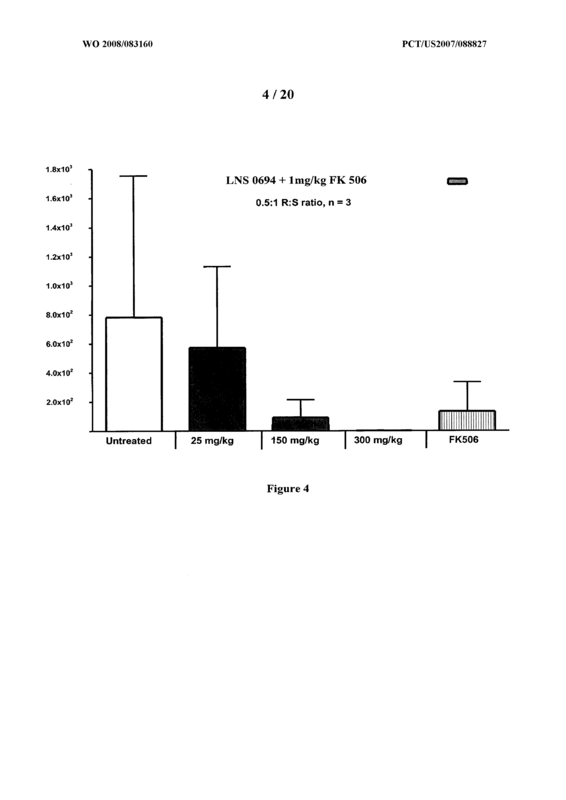 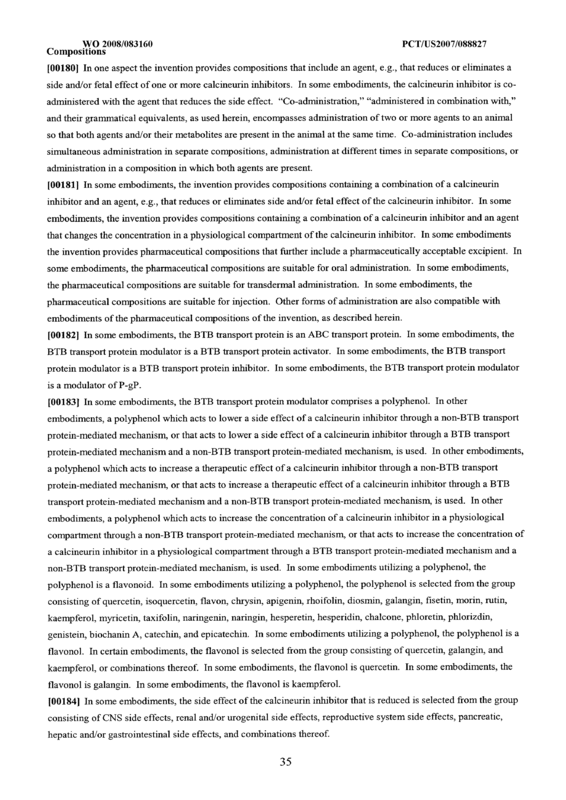 56 The method of claim 26 wherein the calcineurin inhibitor is administered in an amount sufficient to exert a therapeutic effect and the BTB transport protein modulator is administered in an amount sufficient to decrease a side effect of the calcineurin inhibitor by an average of at least about 5%, compared to the side effect without the BTB transport protein modulator. 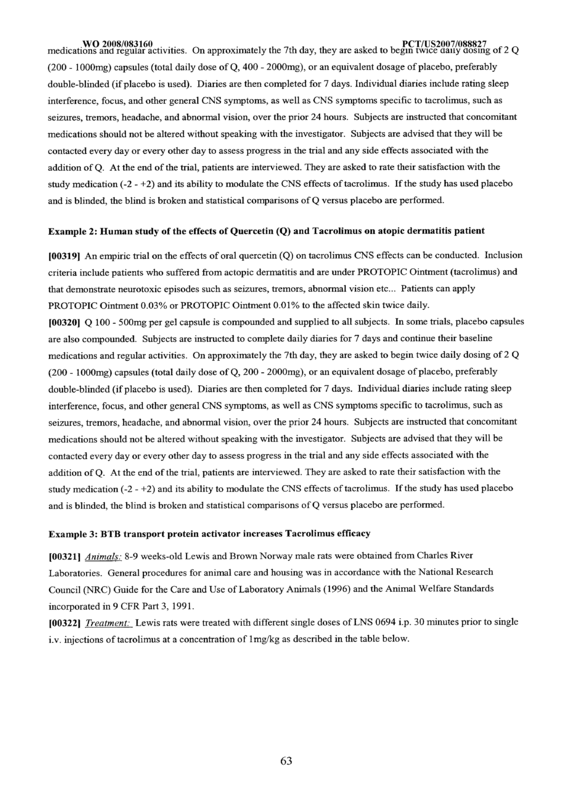 63 The method of claim 62 wherein said hepatic, pancreatic and/or gastrointestinal side effect is hepatic necrosis, hepatotoxicity, liver fatty, venooclusive liver disease, diarrhea, nausea, constipation, vomiting, dyspepsia, anorexia, or LFT abnormal.
. r r uimυi is piescm m an amoun sufficient to decrease a side effect of the calcineurin inhibitor. 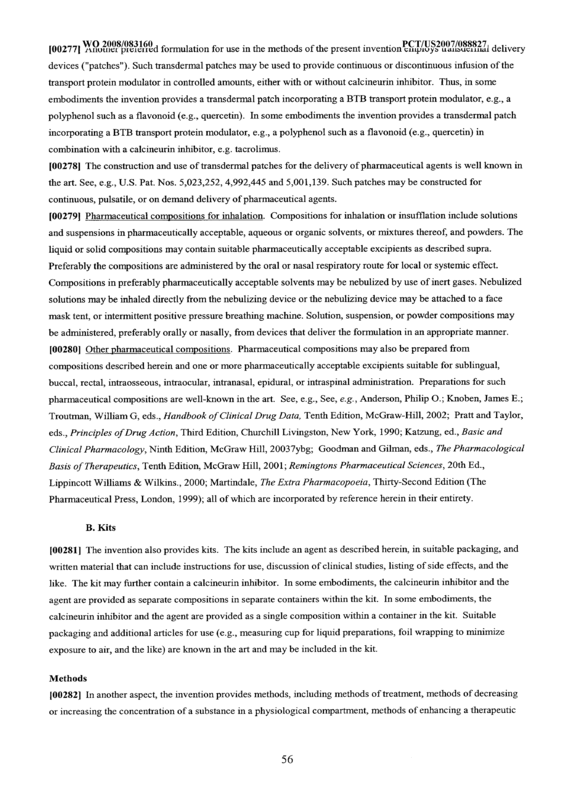 The composition of claim 91 wherein said side effect is selected from the group consisting of CNS side effects, renal and/or urogenital side effects and hepatic, pancreatic and/or gastrointestinal side effects . 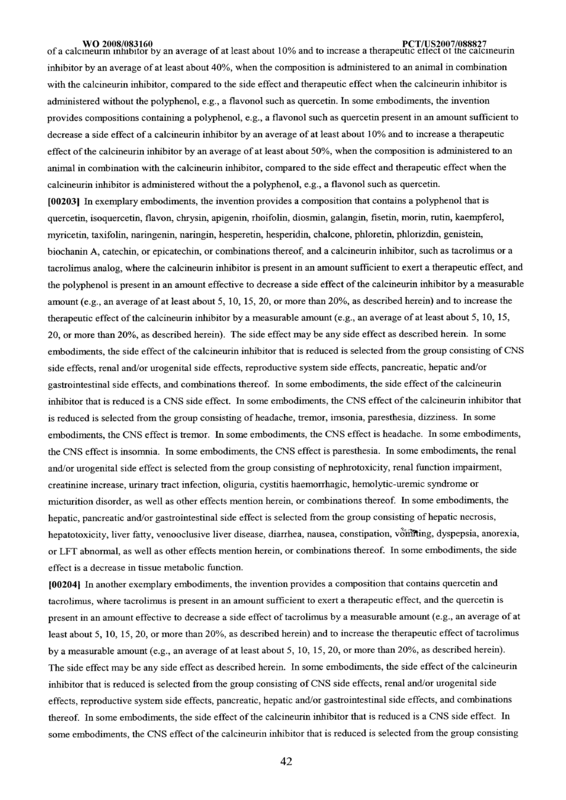 The composition of claim 92 wherein said side effect is a CNS side effect. 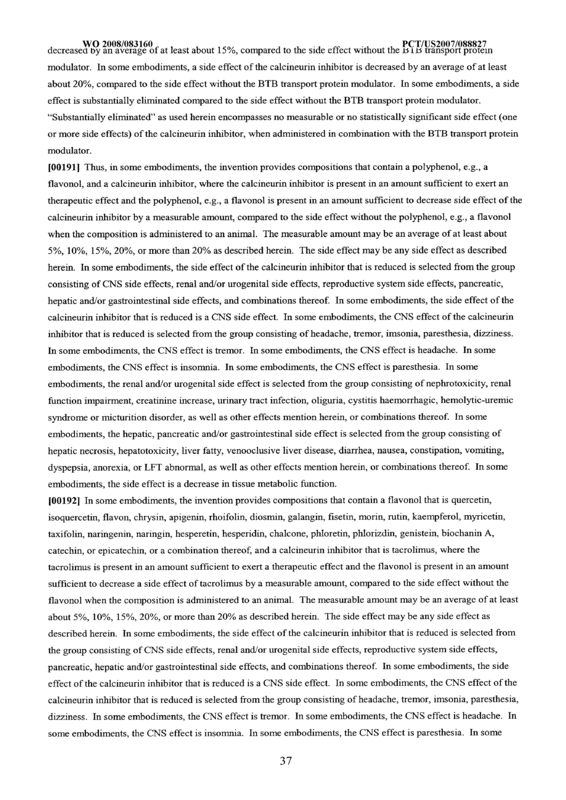 The composition of claim 93 wherein said CNS side effect is selected from the group consisting of tremors, headache, changes in motor function, changes in mental status, changes in sensory functions, seizures, insomnia, paresthesia, dizziness, coma and delirium. 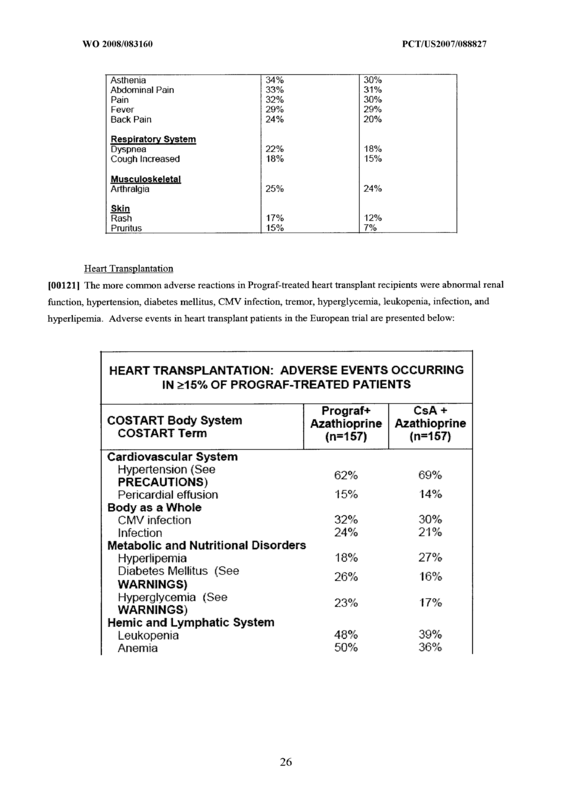 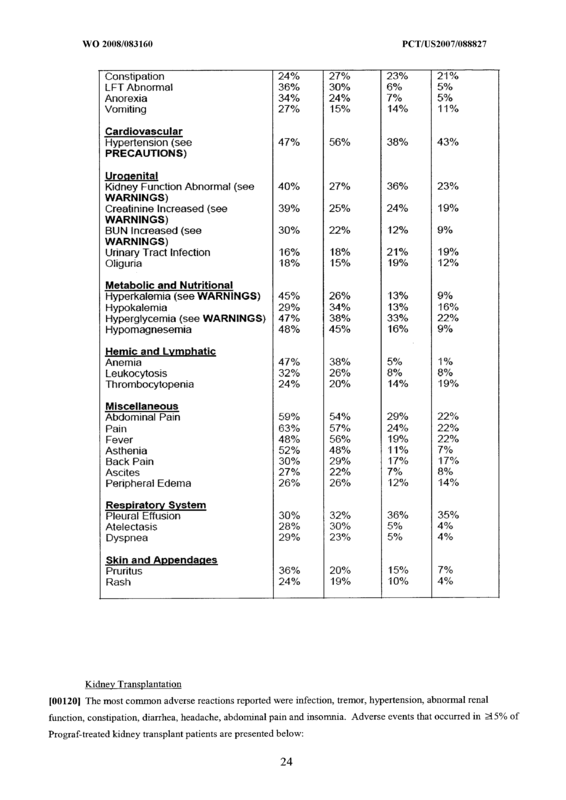 The composition of claim 92 wherein said side effect is a hepatic, pancreatic and/or gastrointestinal side effect. 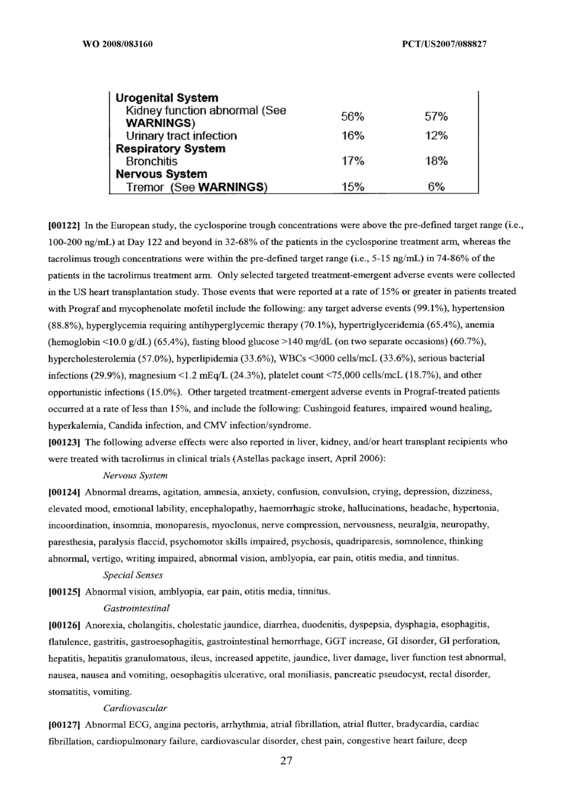 The composition of claim 95 wherein said hepatic, pancreatic and/or gastrointestinal side effect is hepatic necrosis, hepatotoxicity, liver fatty, venooclusive liver disease, diarrhea, nausea, constipation, vomiting, dyspepsia, anorexia, or LFT abnormal. 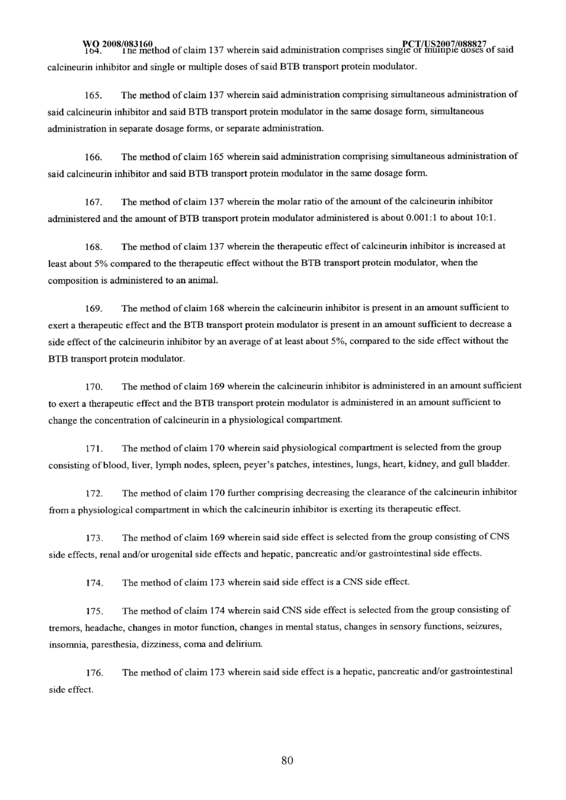 The composition of claim 92 wherein said side effect is a renal and/or urogenital side effect. 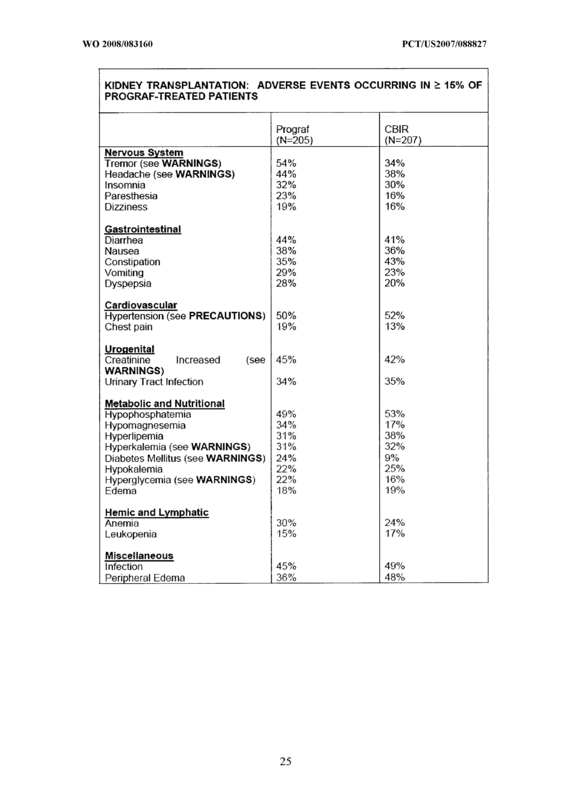 The composition of claim 97 wherein said renal and/or urogenital side effect side effect is nephrotoxicity, renal function impairment, creatinine increase, urinary tract infection, oliguria, cystitis haemorrhagic, hemolytic-uremic syndrome or micturition disorder. 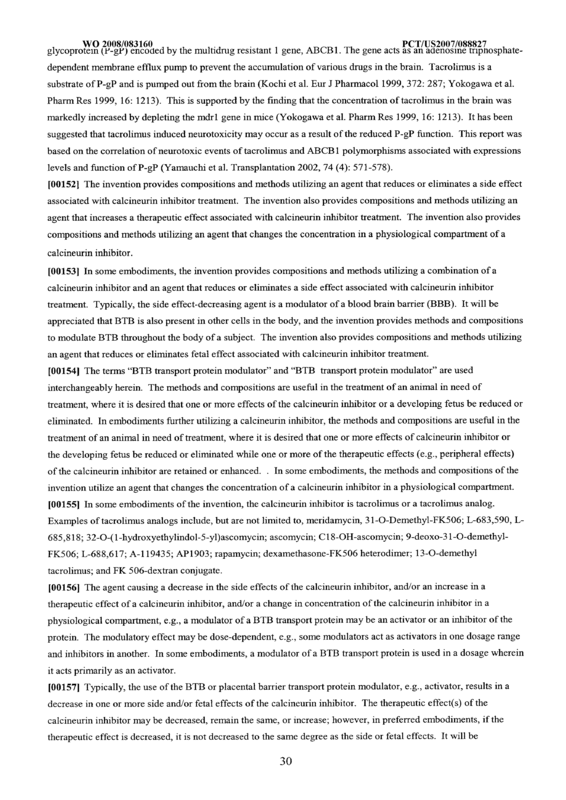 The composition of claim 91 wherein said side effect is a decrease in tissue metabolic function. 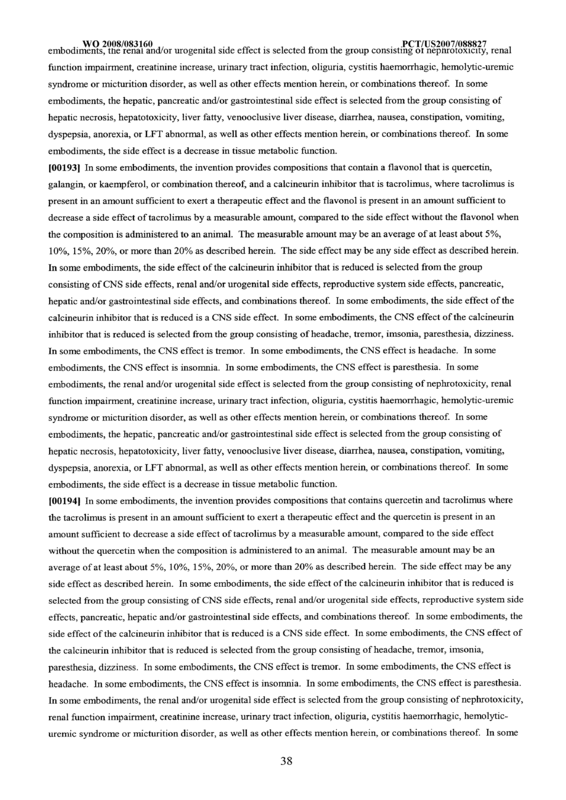 The composition of claim 75 wherein the calcineurin inhibitor is present in an amount sufficient to exert a therapeutic effect and the BTB transport protein modulator is present in an amount sufficient to change the concentration of the calcineurin inhibitor in a physiological compartment compared to concentration of the calcineurin inhibitor in said a physiological compartment without the BTB transport protein modulator. 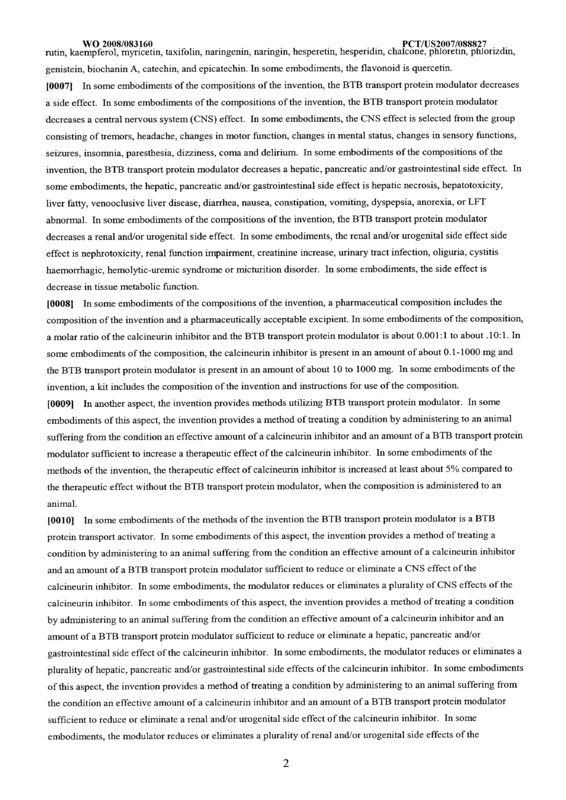 The composition of claim 100 wherein the calcineurin inhibitor is present in an amount sufficient to exert a therapeutic effect and the BTB transport protein modulator is present in an amount sufficient to increase the concentration of the calcineurin inhibitor in a physiological compartment. 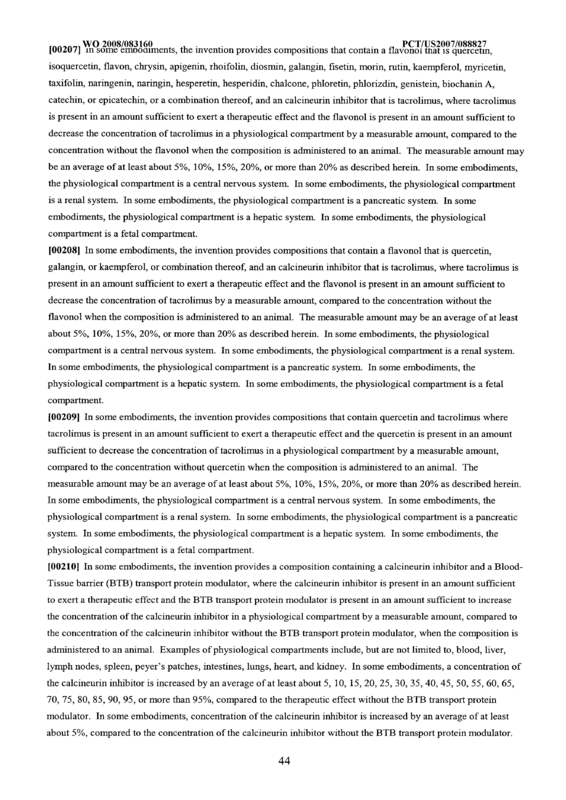 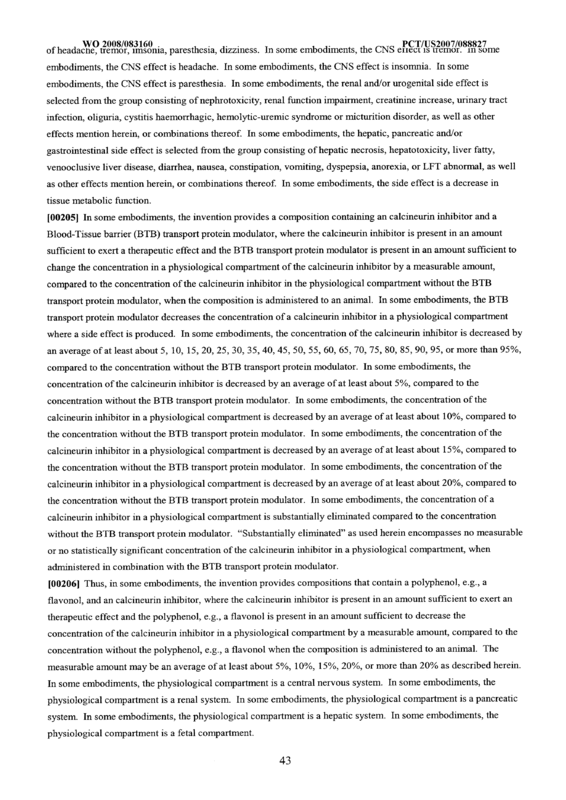 The composition of claim 101 wherein said physiological compartment is selected from the group consisting of blood, lymph nodes, spleen, peyer's patches, lungs, and heart. 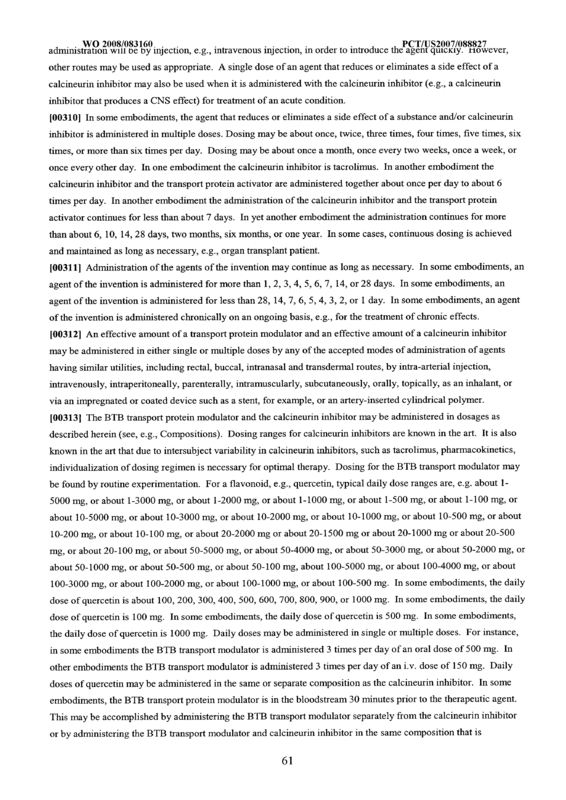 The composition of claim 100 wherein the calcineurin inhibitor is present in an amount sufficient to exert a therapeutic effect and the BTB transport protein modulator is present in an amount sufficient to decrease the concentration of the calcineurin inhibitor in a physiological compartment. 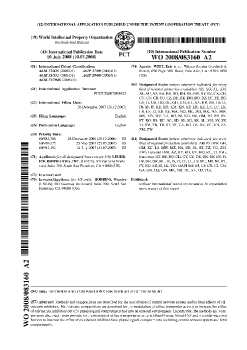 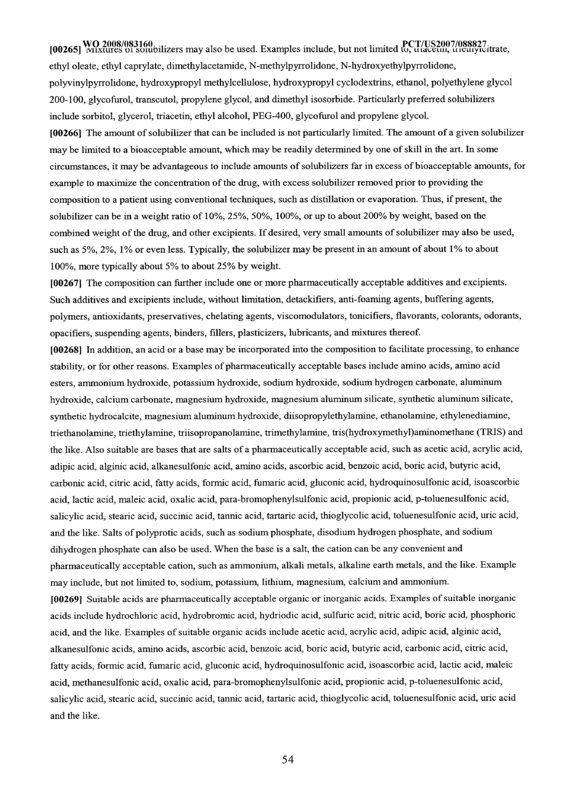 108 A pharmaceutical composition comprising the composition of claim 106 and a pharmaceutically acceptable carrier. 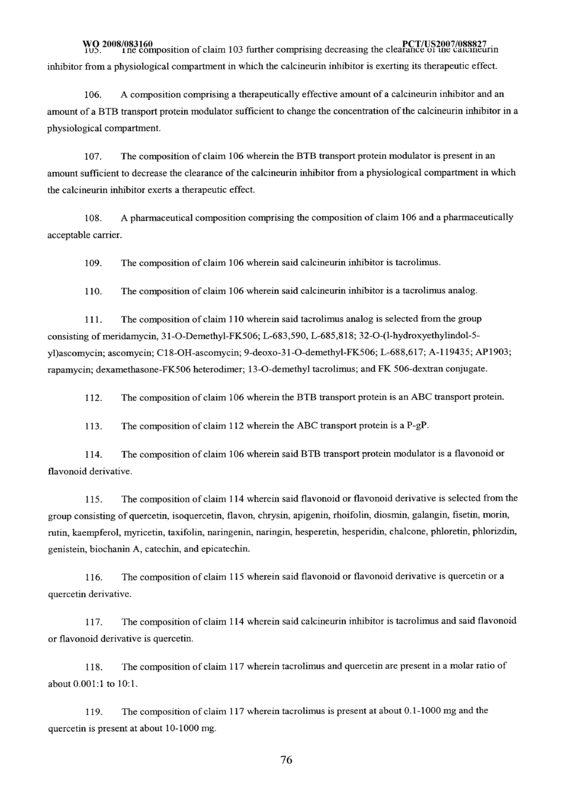 112 The composition of claim 106 wherein the BTB transport protein is an ABC transport protem. 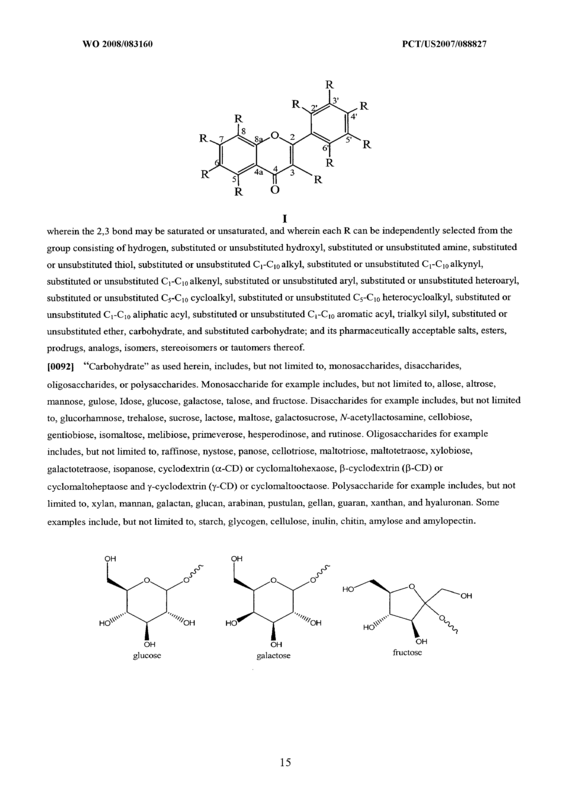 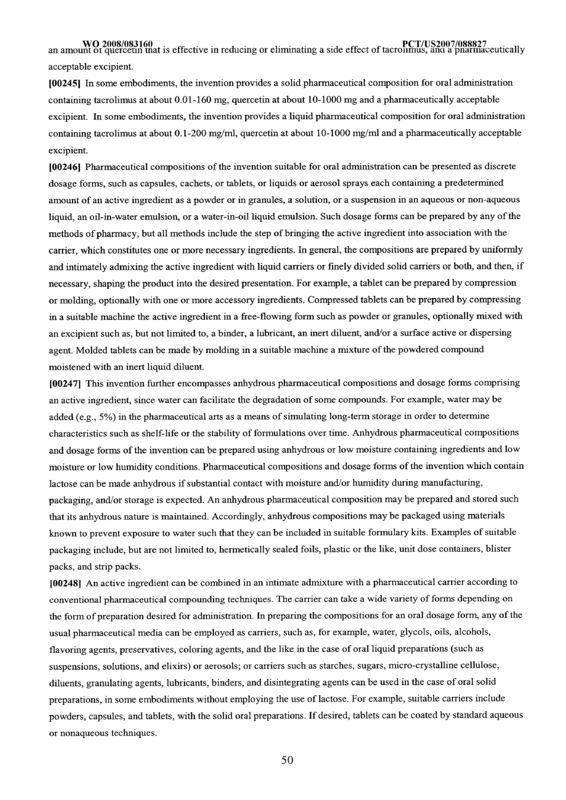 The composition of claim 114 wherein said flavonoid or flavonoid derivative is selected from the group consisting of quercetm, lsoquercetm, flavon, chrysm, apigenin, rhoifohn, diosmm, galangin, fϊsetin, moπn, rutin, kaempferol, myricetm, taxifolm, nanngenin, narmgin, hesperetin, hespeπdin, chalcone, phloretin, phlonzdm, genistein, biochanin A, catechm, and epicatechm. 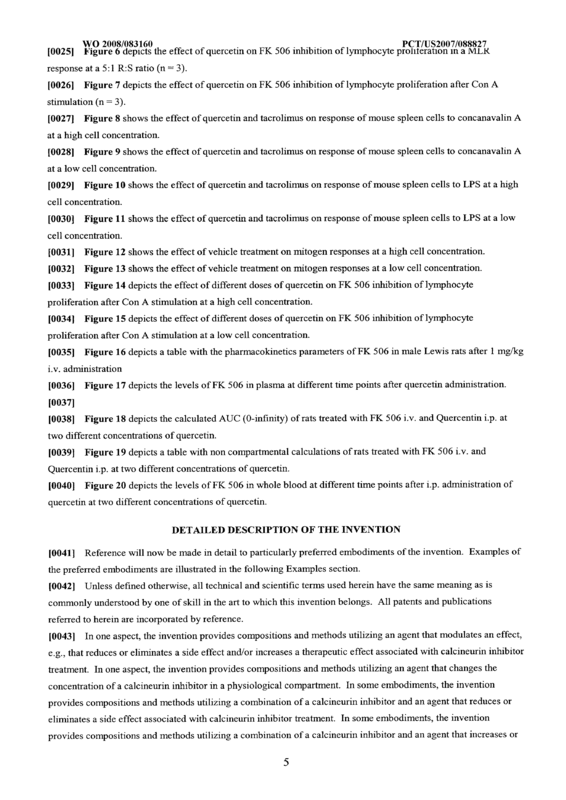 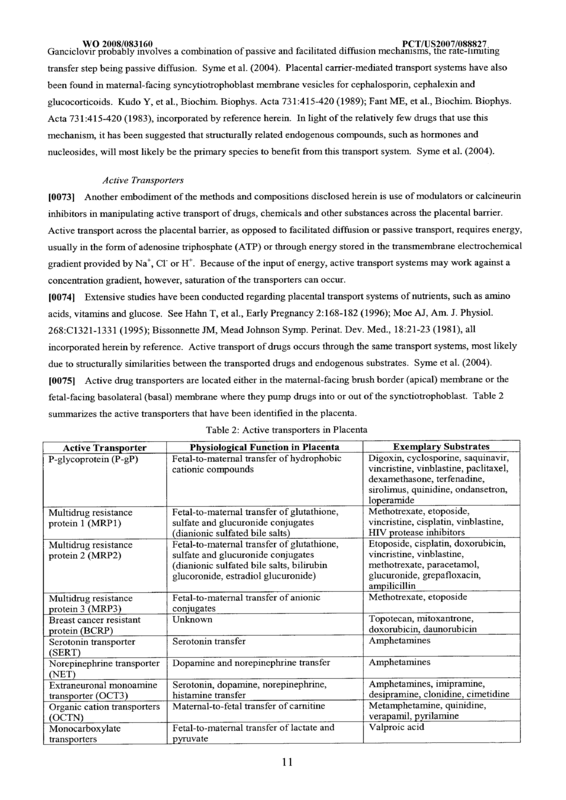 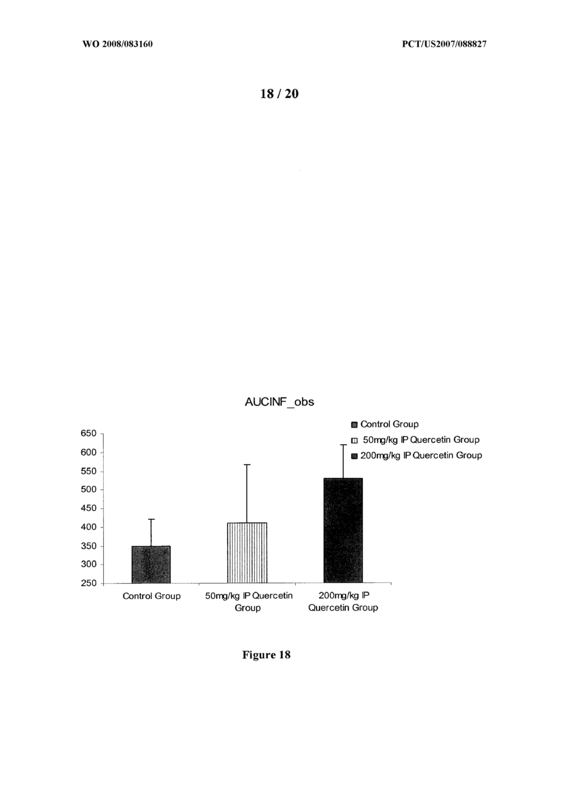 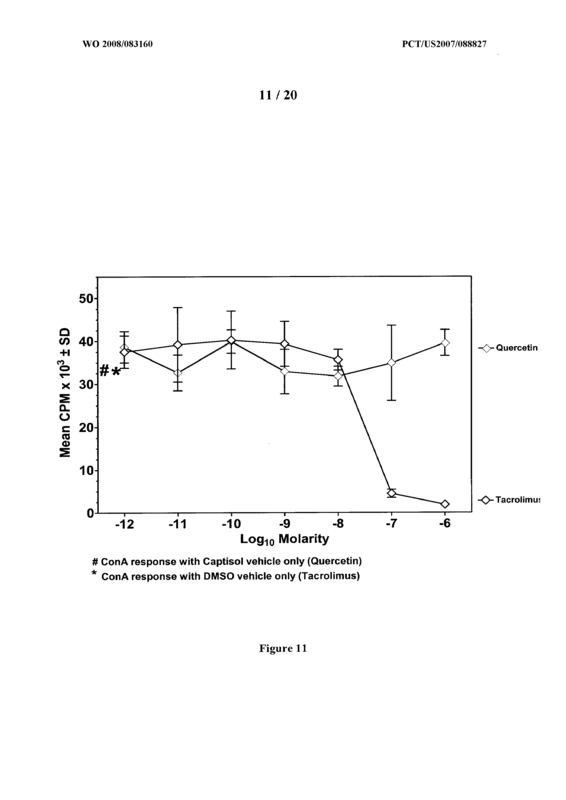 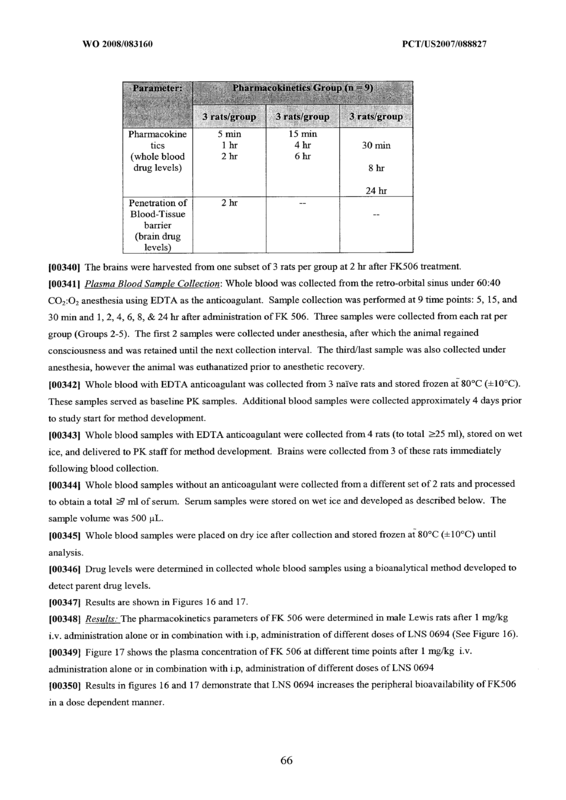 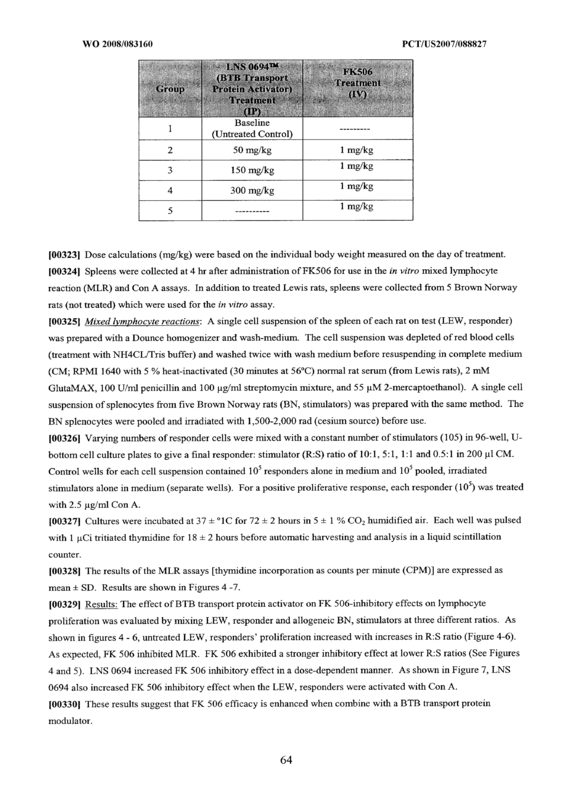 The composition of claim 115 wherein said flavonoid or flavonoid derivative is quercetm or a quercetm derivative.
. ne met o o c aim compπsing a minis ering o a su jec receiving treatment witn sai calcineurin inhibitor an amount of a BTB transport protein modulator sufficient to reduce a plurality side effect in combination with said calcineurin inhibitor. 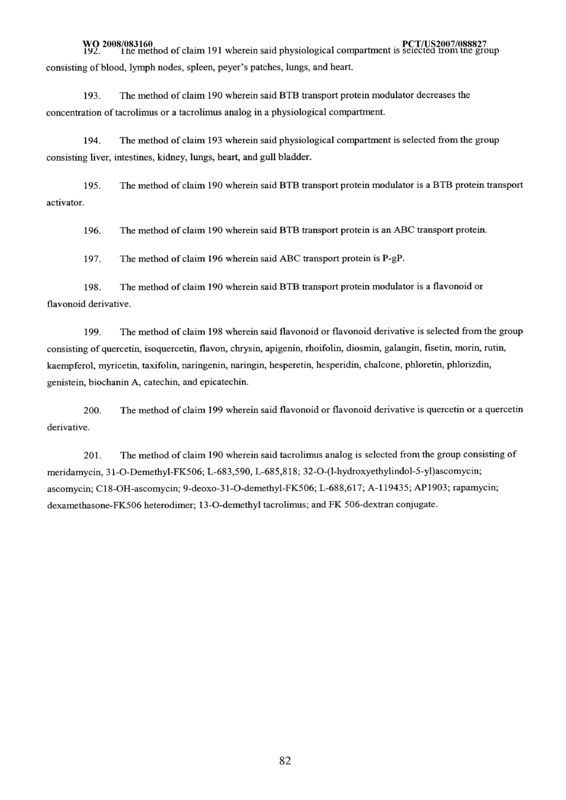 The method of claim 137 wherein said BTB transport protein is an ABC transport protein. 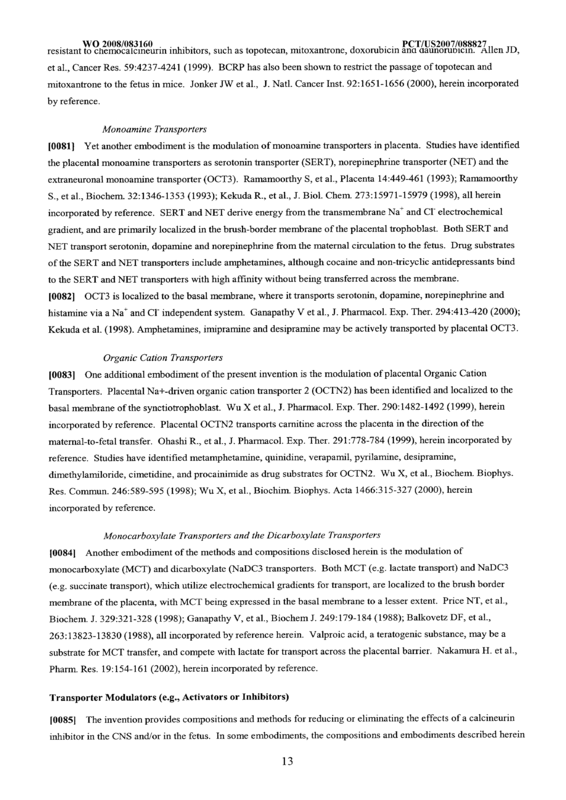 The method of claim 149 wherein said ABC transport protein is P-gP. 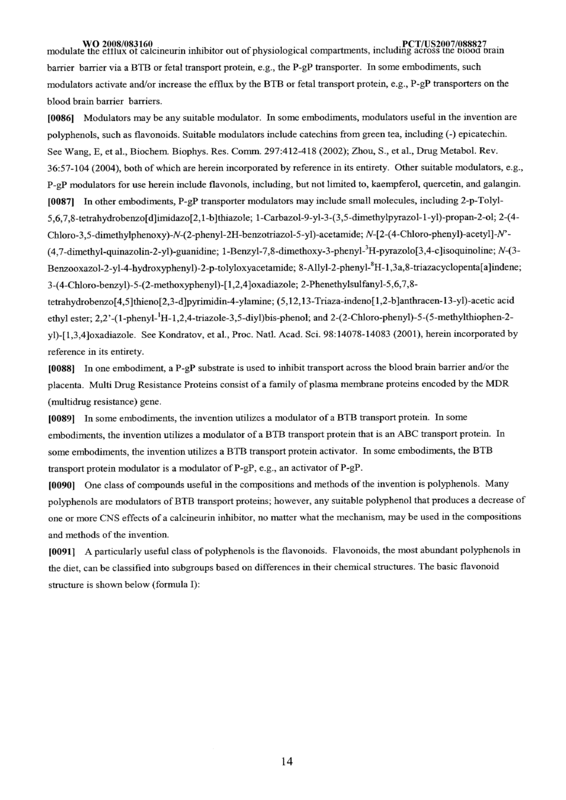 The method of claim 137 wherein said BTB transport protein modulator is a flavonoid or flavonoid derivative. 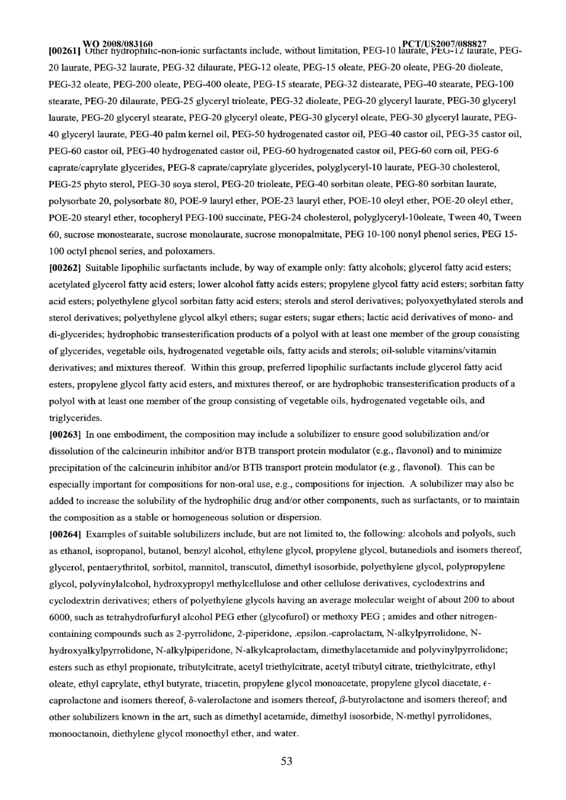 The method of claim 151 wherein said flavonoid or flavonoid derivative is selected from the group consisting of quercetin, isoquercetin, flavon, chrysin, apigenin, rhoifolin, diosmin, galangin, fisetin, morin, rutin, kaempferol, myricetin, taxifolin, naringenin, naringin, hesperetin, hesperidin, chalcone, phloretin, phlorizdin, genistein, biochanin A, catechin, and epicatechin. 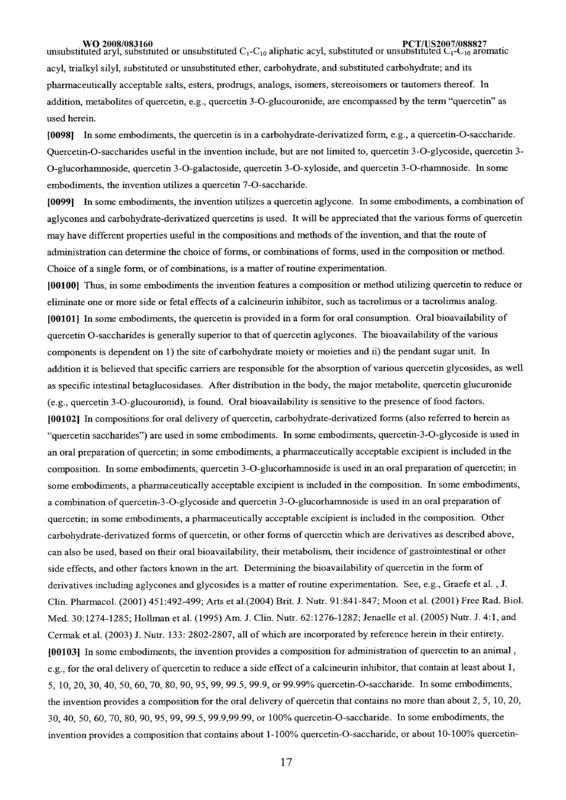 The method of claim 152 wherein said flavonoid or flavonoid derivative is quercetin or a quercetin derivative. 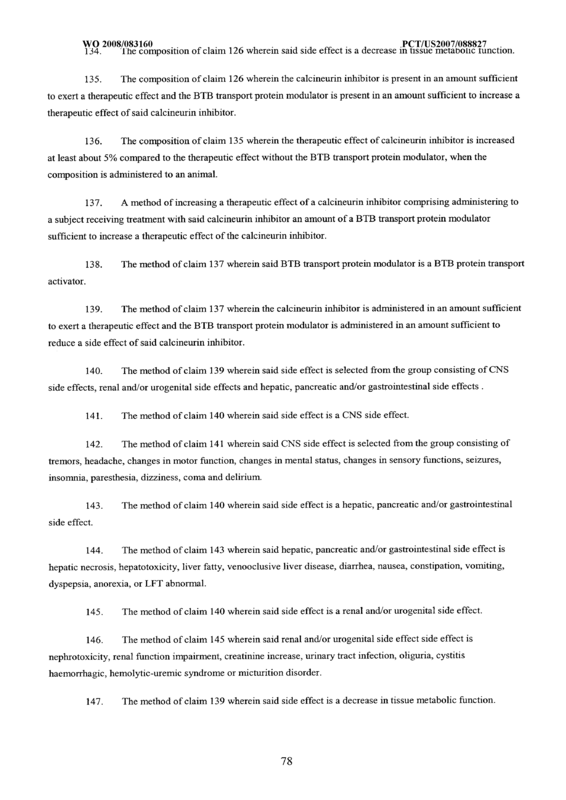 The method of claim 137 wherein said calcineurin inhibitor is tacrolimus. 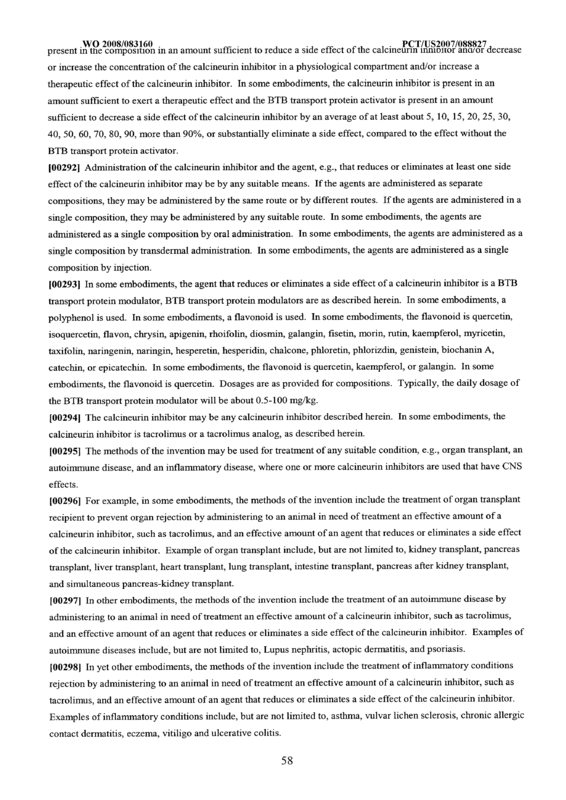 The method of claim 137 wherein said calcineurin inhibitor is a tacrolimus analog. 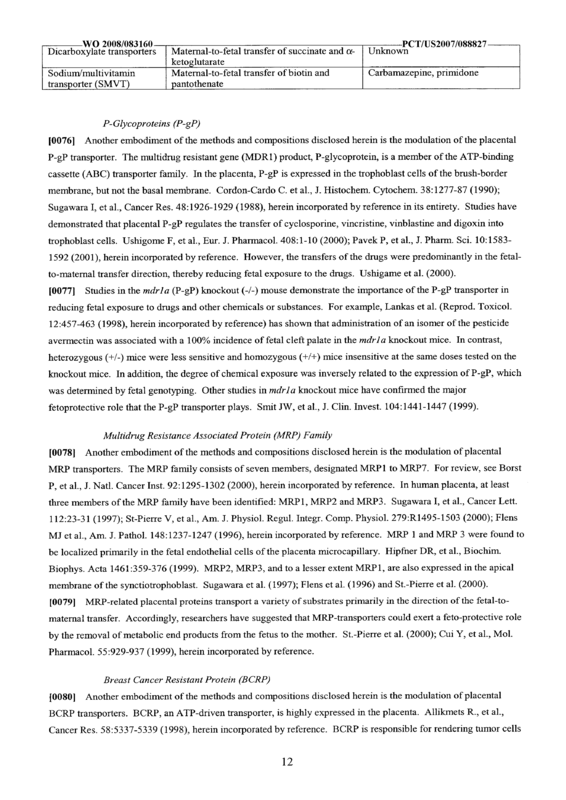 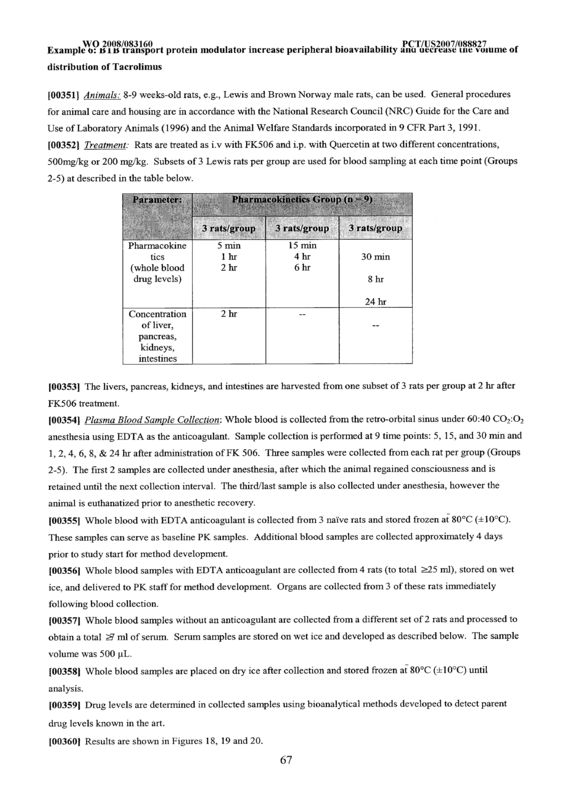 The method of claim 155 wherein said tacrolimus analog is selected from the group consisting of meridamycin, 31-O-Demethyl-FK506; L-683,590, L-685,818; 32-O-(l-hydroxyethylindol-5-yl)ascomycin; ascomycin; C18-OH-ascomycin; 9-deoxo-31-O-demethyl-FK506; L-688,617; A-119435; AP1903; rapamycin; dexamethasone-FK506 heterodimer; 13-O-demethyl tacrolimus; and FK 506-dextran conjugate. 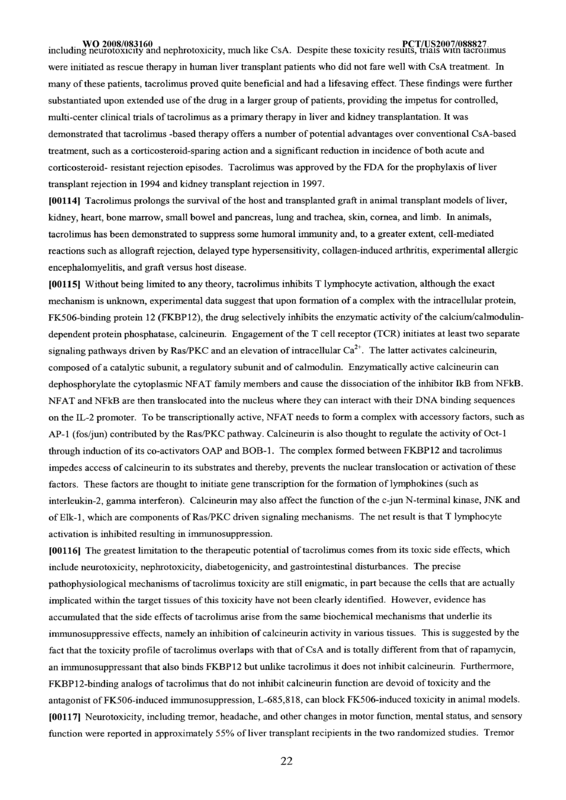 The method of claim 137 wherein said subject suffers from a condition selected from the group consisting of organ transplant, an autoimmune disease, and an inflammatory disease. 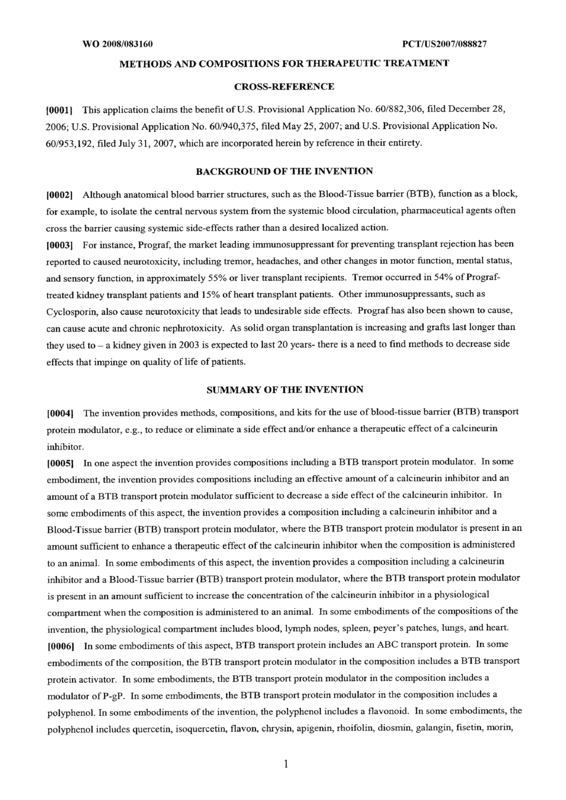 The method of claim 157 wherein said condition is organ transplant. 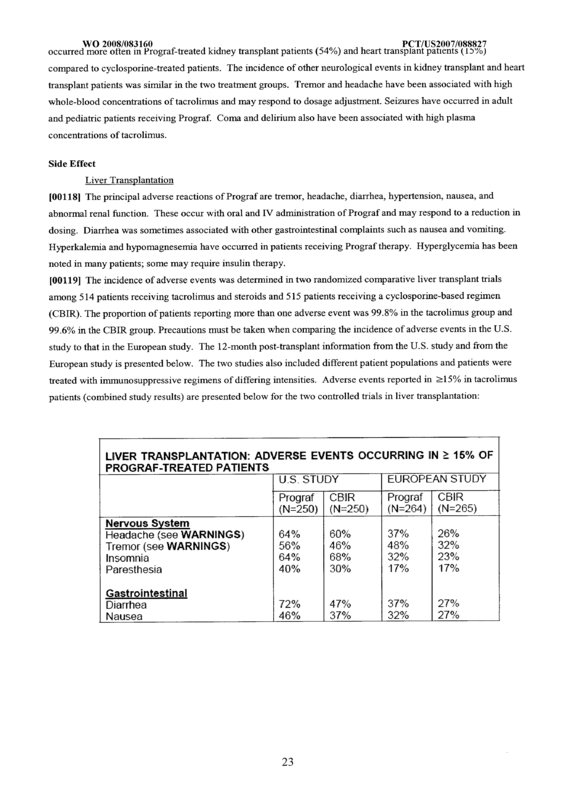 The method of claim 158 wherein said organ transplant is selected from the group consisting of kidney transplant, pancreas transplant, liver transplant, heart transplant, lung transplant, intestine transplant, pancreas after kidney transplant, and simultaneous pancreas-kidney transplant. 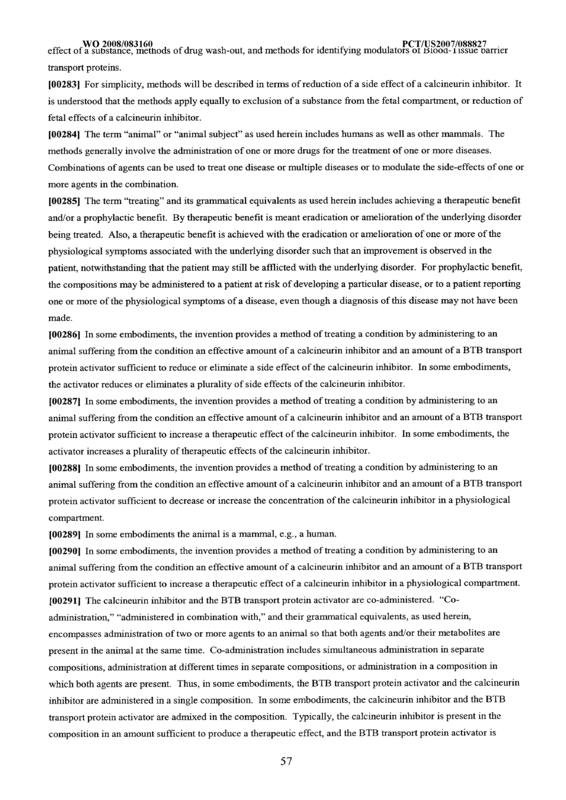 The method of claim 157 wherein said condition is an autoimmune disease. 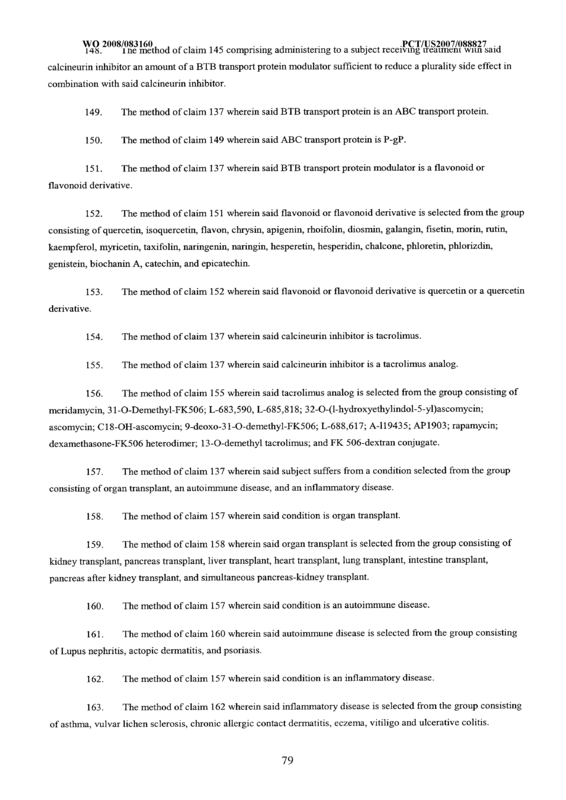 The method of claim 160 wherein said autoimmune disease is selected from the group consisting of Lupus nephritis, actopic dermatitis, and psoriasis. 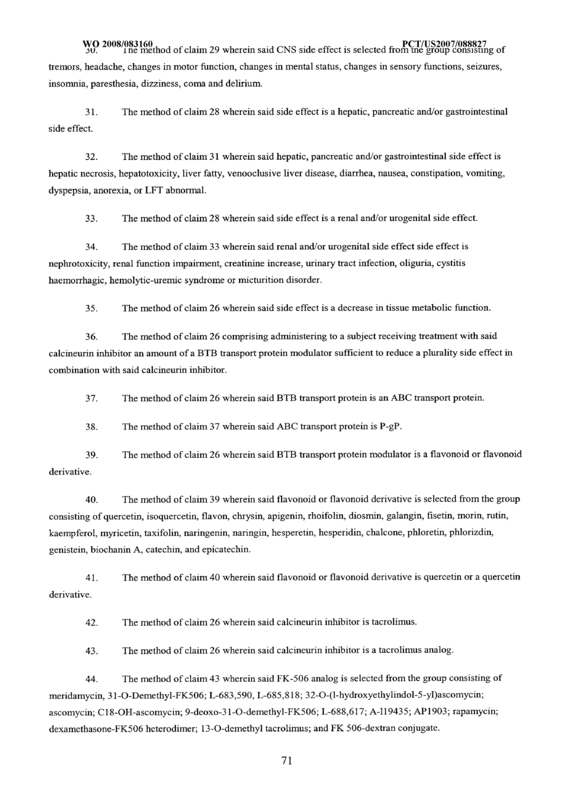 The method of claim 157 wherein said condition is an inflammatory disease. 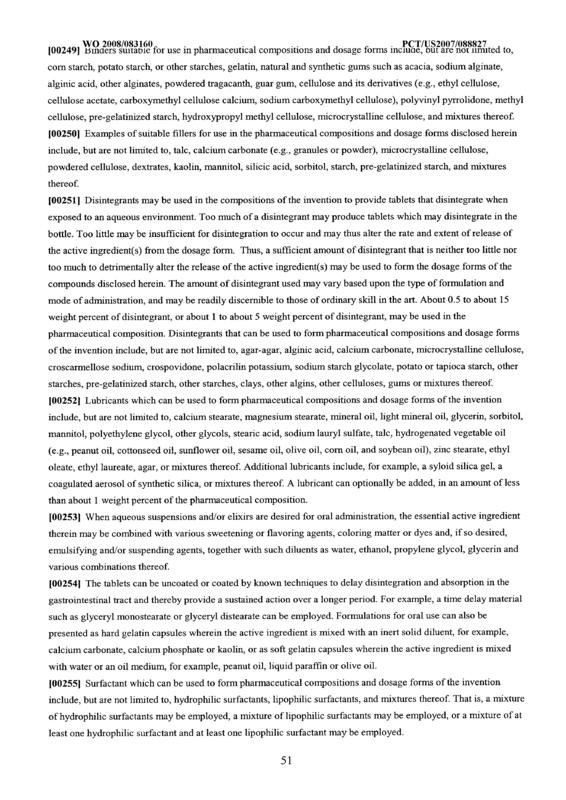 The method of claim 162 wherein said inflammatory disease is selected from the group consisting of asthma, vulvar lichen sclerosis, chronic allergic contact dermatitis, eczema, vitiligo and ulcerative colitis. 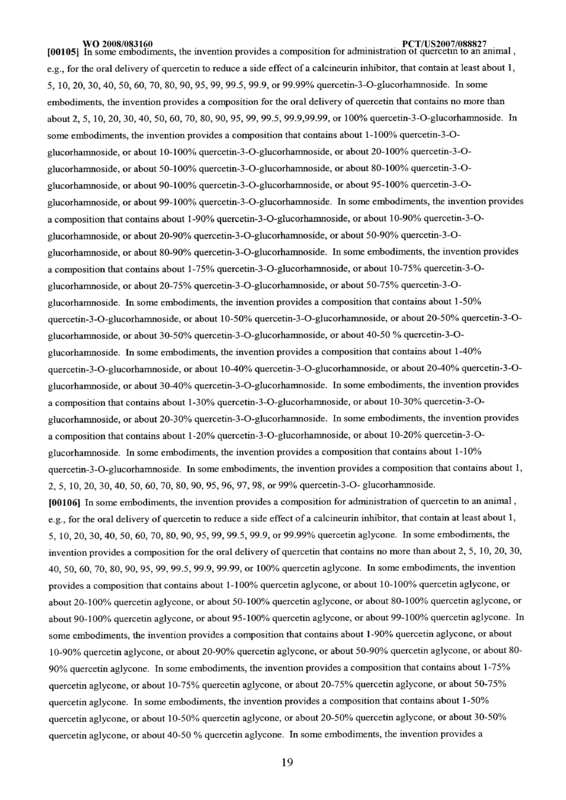 , . 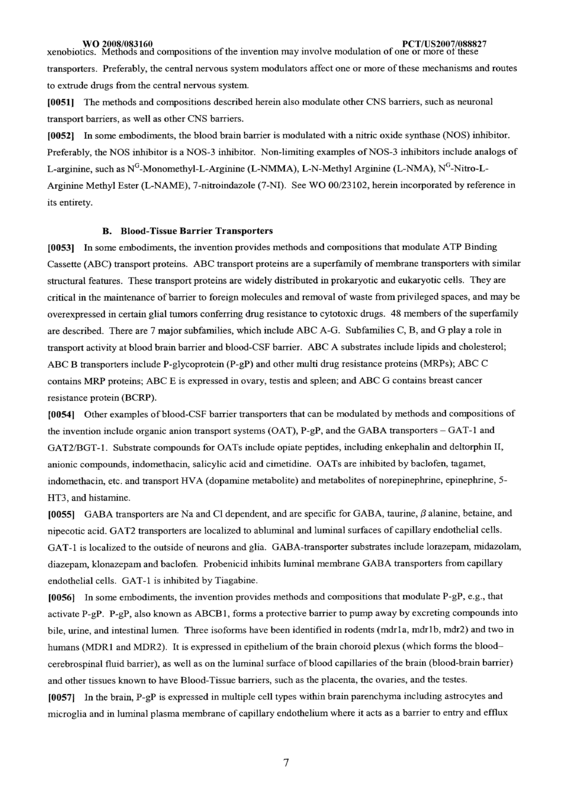 e met o o c aim w erein sai a minis ra ion comprises smgie or muinpie αoses o sai calcineurin inhibitor and single or multiple doses of said BTB transport protein modulator. 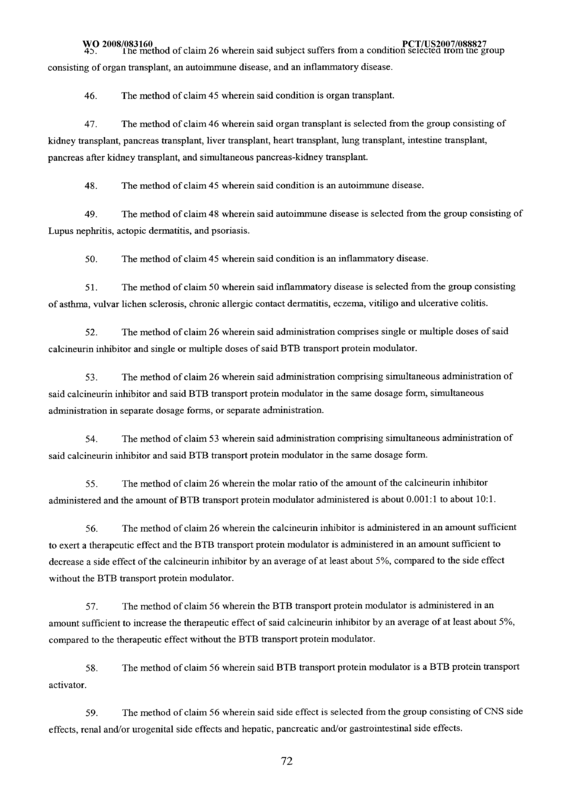 The method of claim 137 wherein said administration comprising simultaneous administration of said calcineurin inhibitor and said BTB transport protein modulator in the same dosage form, simultaneous administration in separate dosage forms, or separate administration. 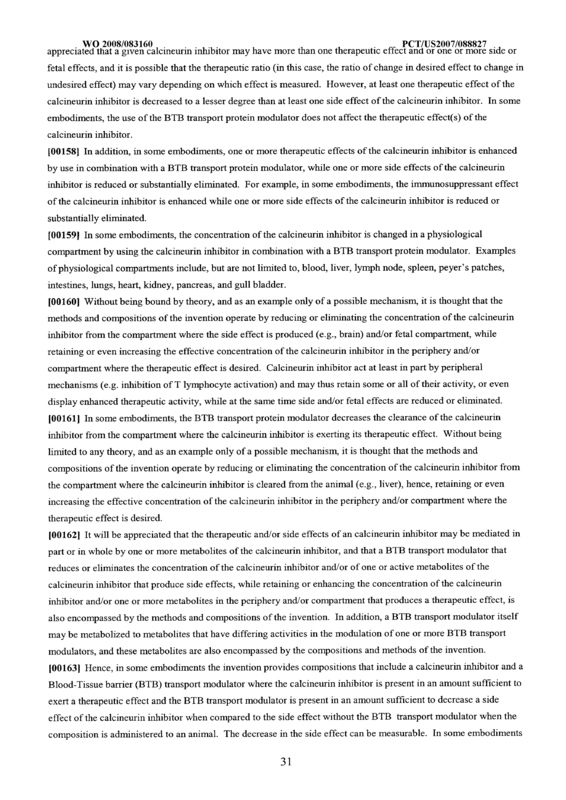 The method of claim 165 wherein said administration comprising simultaneous administration of said calcineurin inhibitor and said BTB transport protein modulator in the same dosage form. 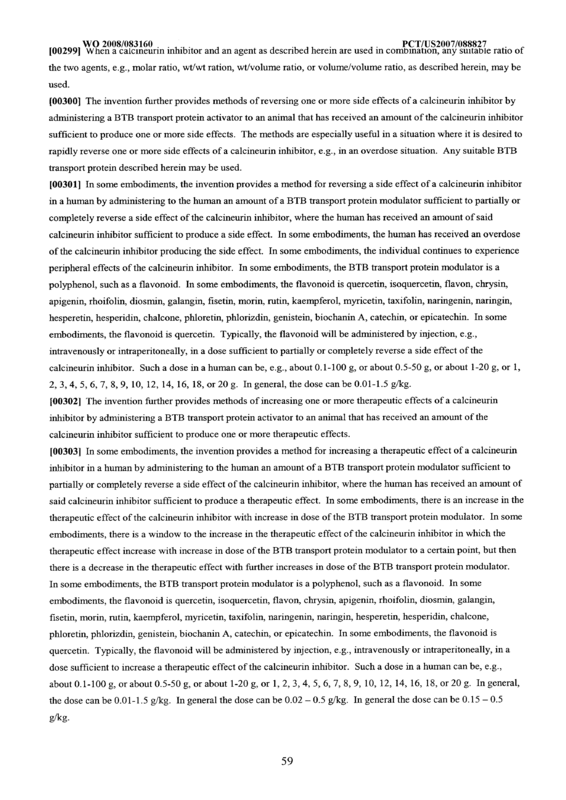 The method of claim 137 wherein the molar ratio of the amount of the calcineurin inhibitor administered and the amount of BTB transport protein modulator administered is about 0.001 : 1 to about 10:1. 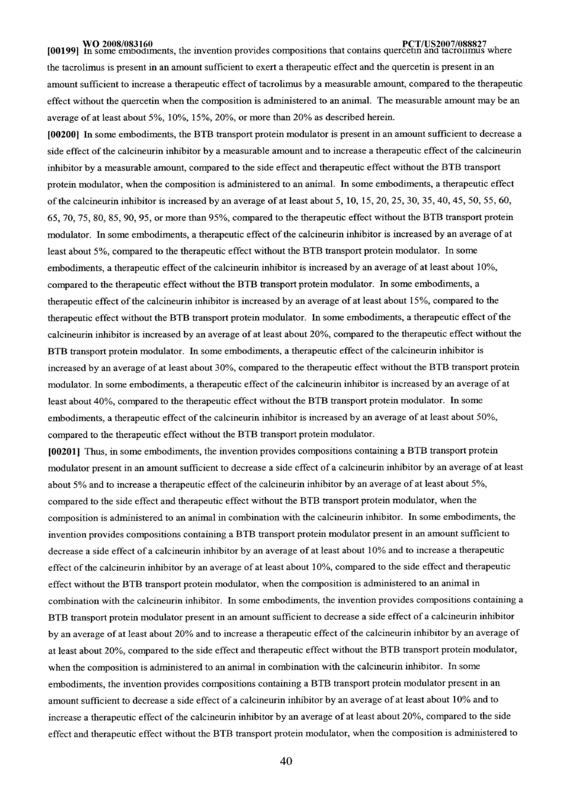 The method of claim 137 wherein the therapeutic effect of calcineurin inhibitor is increased at least about 5% compared to the therapeutic effect without the BTB transport protein modulator, when the composition is administered to an animal. 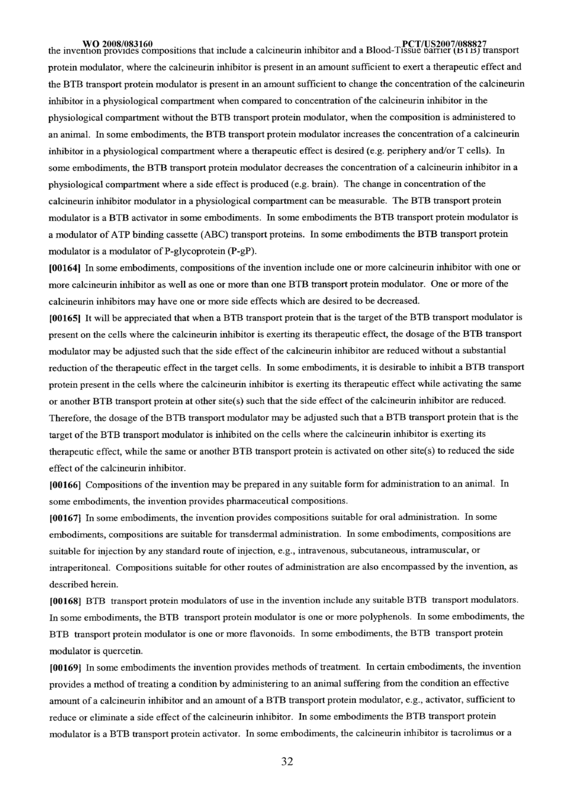 The method of claim 168 wherein the calcineurin inhibitor is present in an amount sufficient to exert a therapeutic effect and the BTB transport protein modulator is present in an amount sufficient to decrease a side effect of the calcineurin inhibitor by an average of at least about 5%, compared to the side effect without the BTB transport protein modulator. 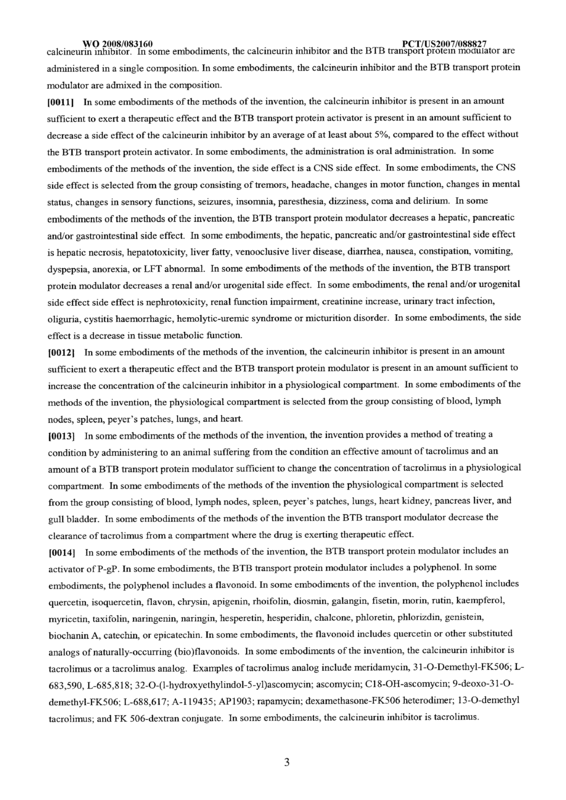 The method of claim 169 wherein the calcineurin inhibitor is administered in an amount sufficient to exert a therapeutic effect and the BTB transport protein modulator is administered in an amount sufficient to change the concentration of calcineurin in a physiological compartment. 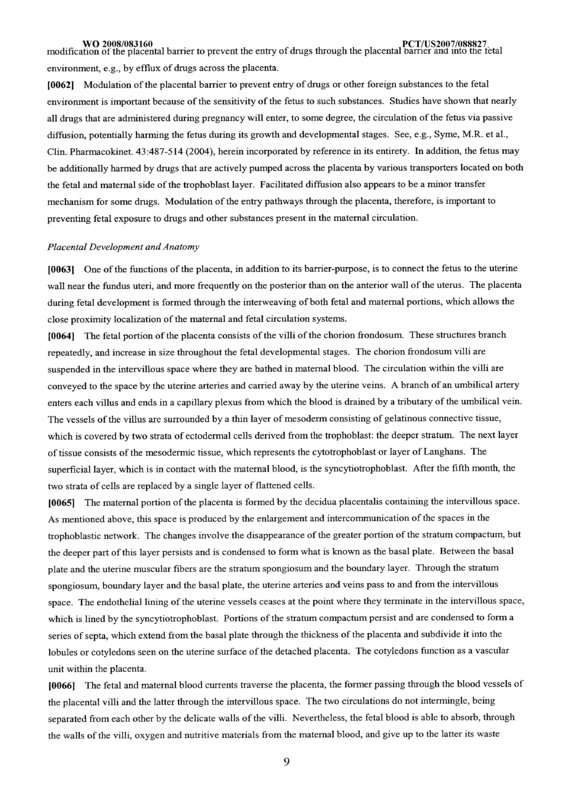 The method of claim 170 wherein said physiological compartment is selected from the group consisting of blood, liver, lymph nodes, spleen, peyer's patches, intestines, lungs, heart, kidney, and gull bladder. 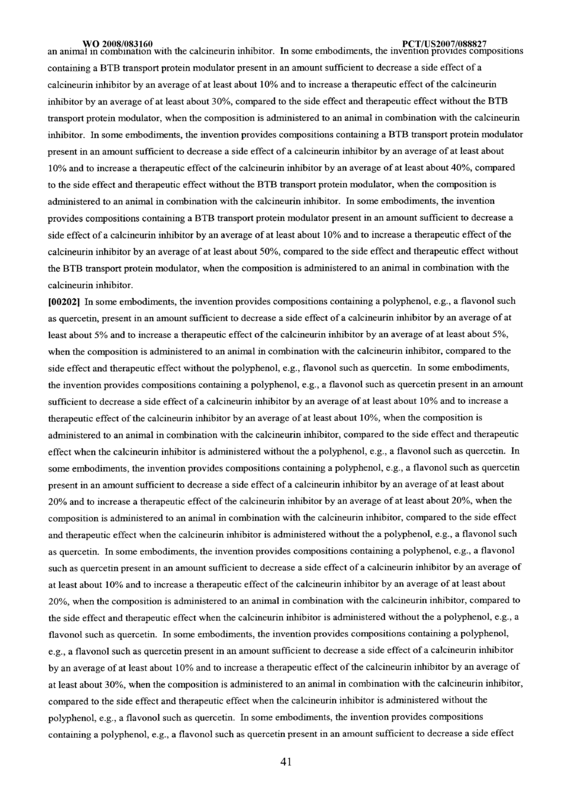 The method of claim 170 further comprising decreasing the clearance of the calcineurin inhibitor from a physiological compartment in which the calcineurin inhibitor is exerting its therapeutic effect. 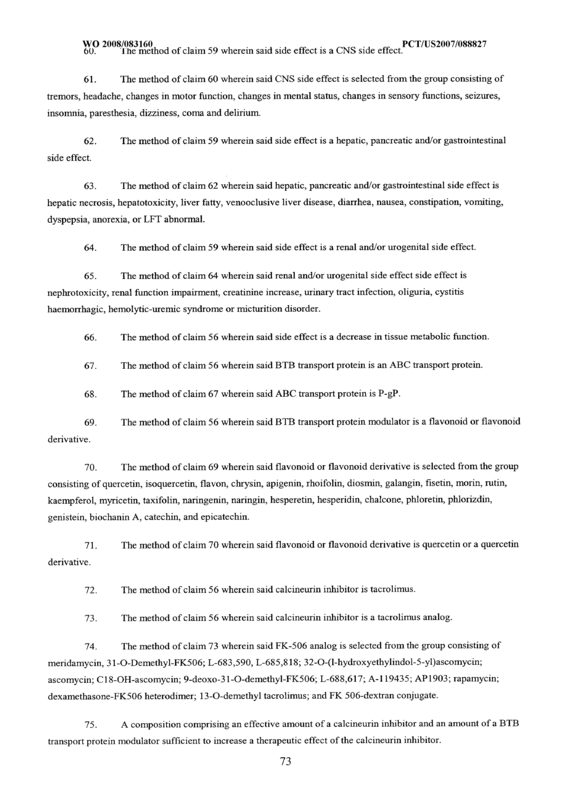 The method of claim 169 wherein said side effect is selected from the group consisting of CNS side effects, renal and/or urogenital side effects and hepatic, pancreatic and/or gastrointestinal side effects. 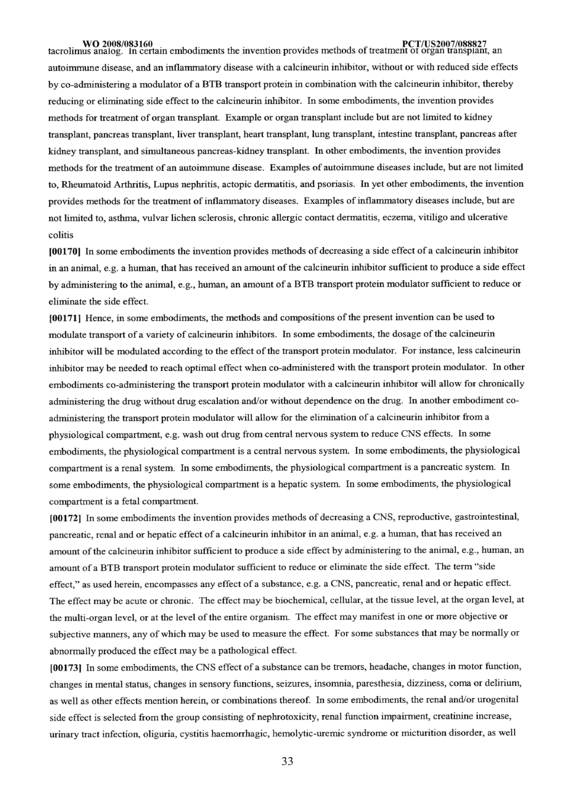 The method of claim 173 wherein said side effect is a CNS side effect. 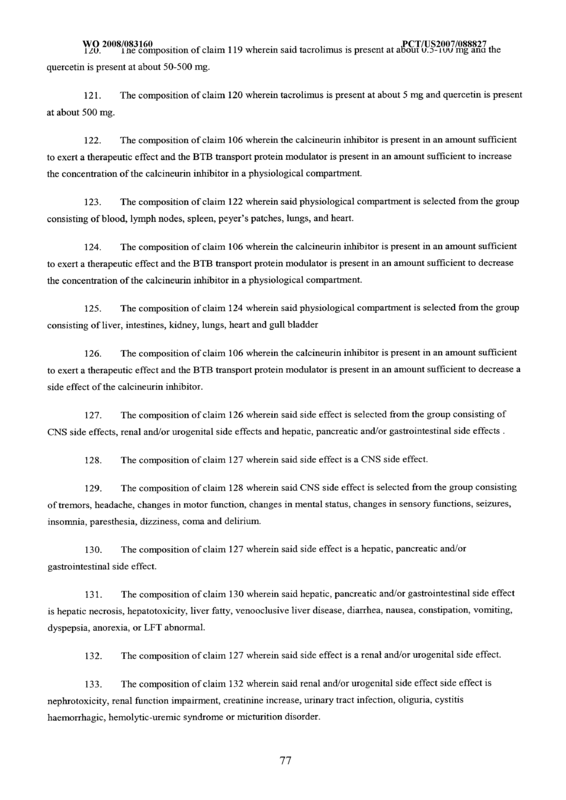 The method of claim 174 wherein said CNS side effect is selected from the group consisting of tremors, headache, changes in motor function, changes in mental status, changes in sensory functions, seizures, insomnia, paresthesia, dizziness, coma and delirium. 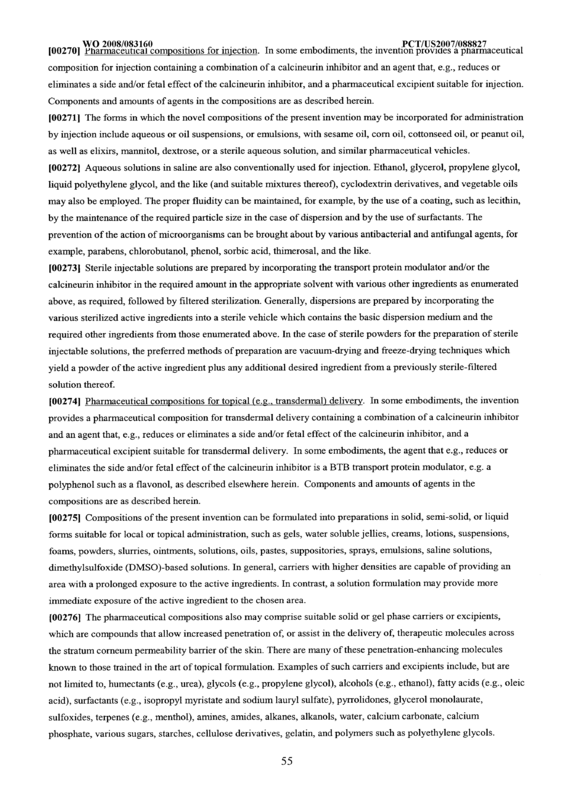 The method of claim 173 wherein said side effect is a hepatic, pancreatic and/or gastrointestinal side effect. 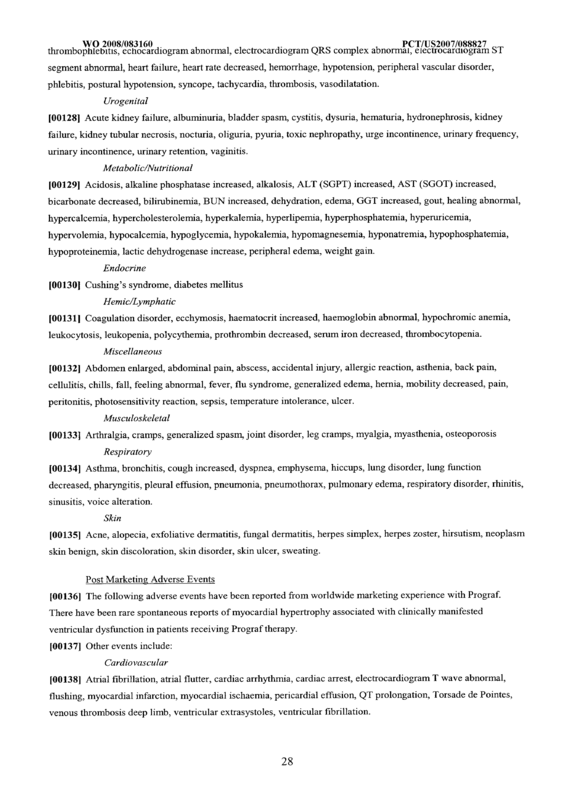 , iiυiπicMmdi MUG ciic hepatic necrosis, hepatotoxicity, liver fatty, venooclusive liver disease, diarrhea, nausea, constipation, vomiting, dyspepsia, anorexia, or LFT abnormal. 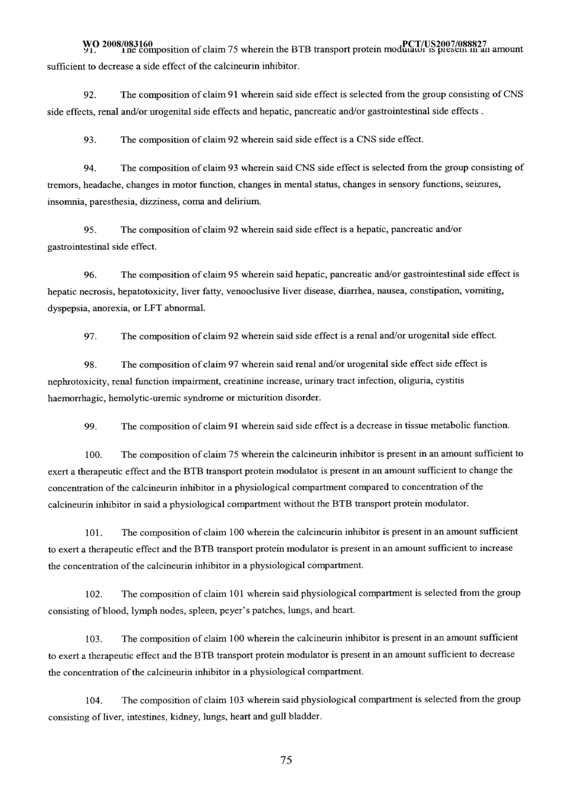 178 The method of claim 173 wherein said side effect is a renal and/or urogenital side effect. 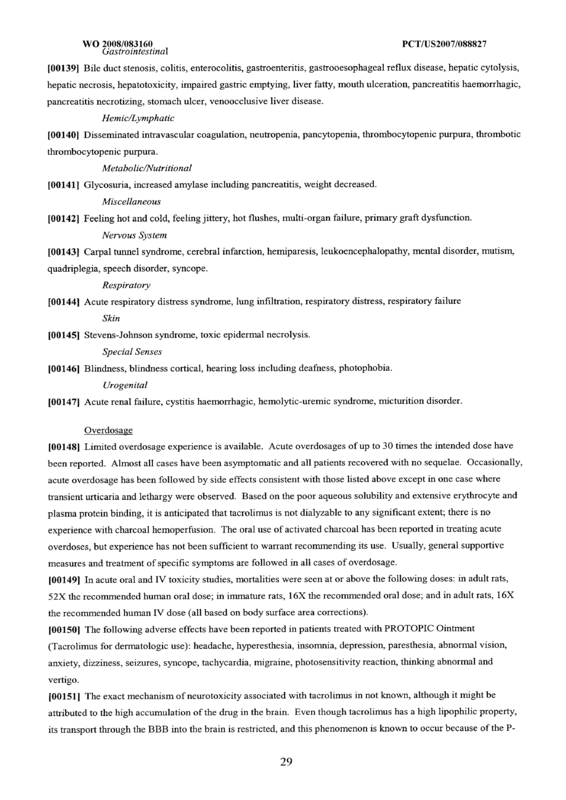 179 The method of claim 178 wherein said renal and/or urogenital side effect side effect is nephrotoxicity, renal function impairment, creatinine increase, urinary tract infection, oliguria, cystitis haemorrhagic, hemolytic-uremic syndrome or micturition disorder. 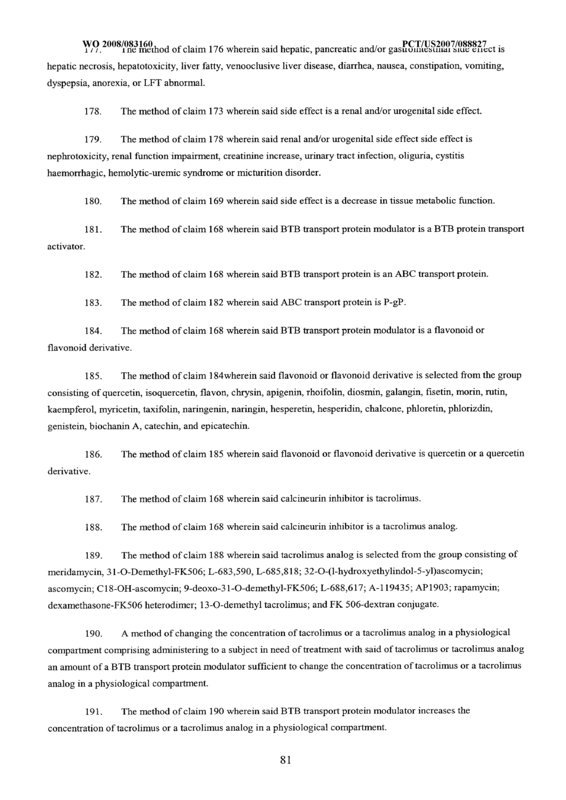 194 The method of claim 193 wherein said physiological compartment is selected from the group consisting liver, intestines, kidney, lungs, heart, and gull bladder.